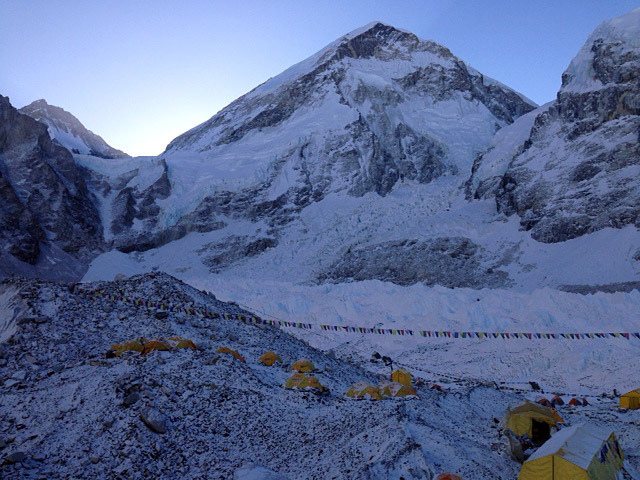 *UPDATE May 10: We have heard that some climbers have helicoptered up to Camp 2 for an attempt, so stay tuned! We still have a lot of business matters to attend to before we can wrap up the 2014 season. The various outfitters in Kathmandu (who together make up the EOA) have submitted their formal requests to the Ministry, but given the inherent nature of the Nepal bureaucracy, I would not be holding my breath for news anytime soon. Nonetheless, I do believe that the issues will eventually get worked out and that IMG will be back climbing Mt. 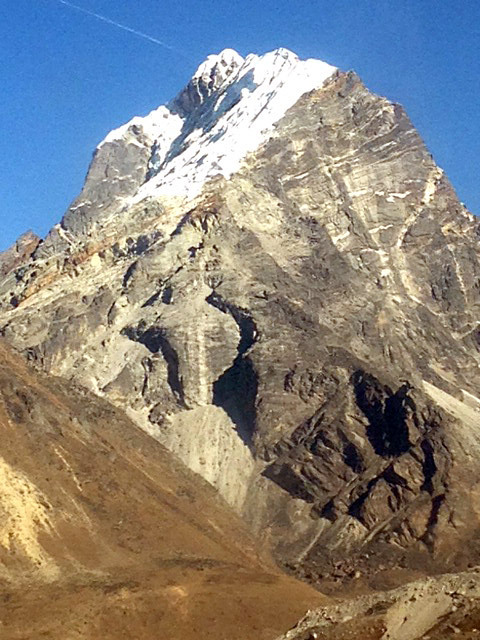 Everest in 2015 from the Nepal side. I have been asked whether we would do consider doing another Everest expedition via the North side (where I have organized 8 expeditions over the years). The short answer is yes, but we remain concerned about visa and permit problems in spring season. It is a huge risk to organize a major expedition, just to find out at the last minute that the permit is cancelled. 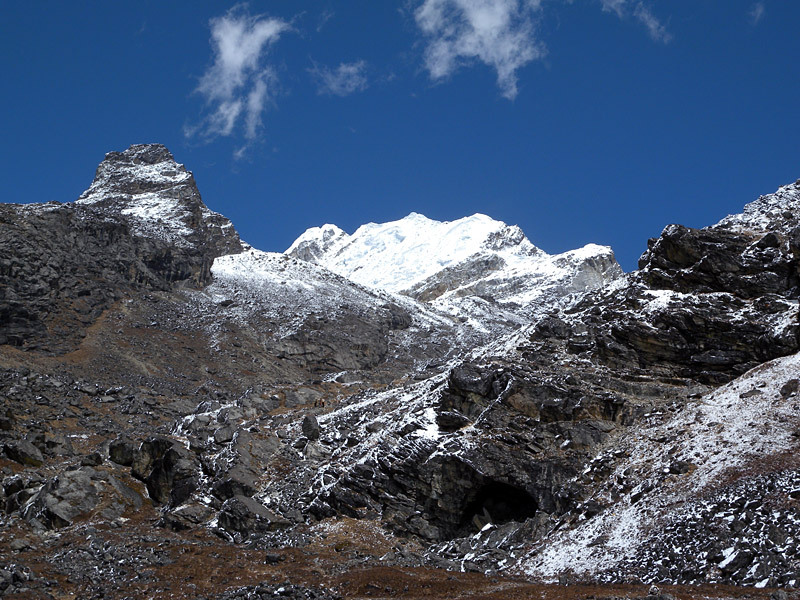 The autumn season permits (for example, for Cho Oyu) have been less of a problem. However, climbing Everest via the North Ridge in the autumn has too much avalanche hazard on the North Col, so we would not do that. 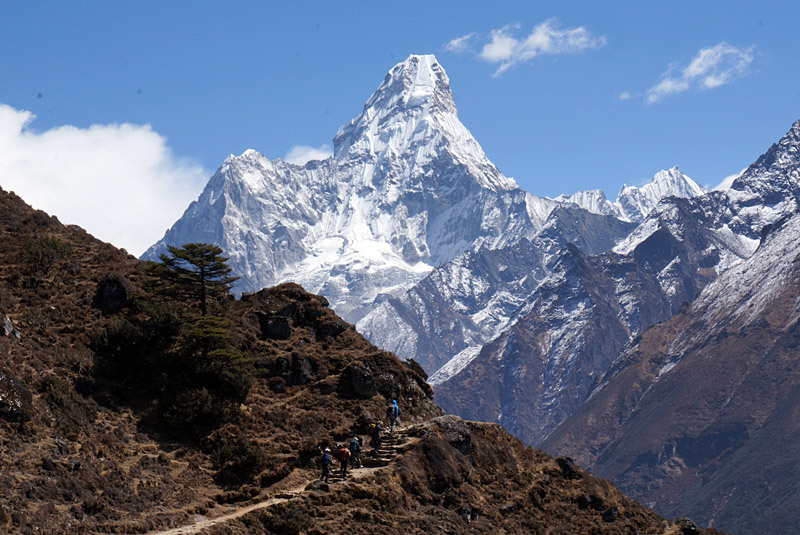 Thanks for following along with our 2014 Everest climb. It has been a roller coaster of emotions over the past 6 weeks for all of us. Now it is time for everyone to go home, give your family and friends a big hug, and make a difference. Question: what happens when 350 climbers and 2000 duffel bags all hit Lukla at the beginning of a protracted period of bad weather? Answer... it's duffel shuffle time again! The weather cleared briefly this afternoon, just enough time for a couple of flights to get in and out of Lukla before the clouds closed back in. These flights were for passengers only, no duffel bags allowed on the planes, and we were fortunate to get IMG guides Justin, Max, and Austin out this afternoon. That leaves only IMG guide Luke Reilly sitting in Lukla with 20 duffel bags to keep him company. Hang in there, Luke, we'll have you out in the next week or two, I'm sure! Yesterday IMG guides Ang Jangbu, Greg, Aaron, Mike, and Andy attended the Nepal Mountaineering Association memorial in Kathmandu for the fallen sherpas. Our thoughts and prayers go out to these men, their relatives, and friends. My sympathy is profound, especially for the families back at home who have the difficult job of picking up the pieces and continuing. Ang Jangbu reports some good news. Kami, our IMG sherpa who got hit on the knee by a chunk of ice in the avalanche, got discharged from the hospital three days ago. After the expedition, one of our Everest climbers, Dr. Leslie Gullahorn, is doing some work at Nepal Orthopaedic Hospital in Jorpari so Jangbu, Greg, and Kami visited her yesterday. She checked Kami out and was happy to see him doing well. 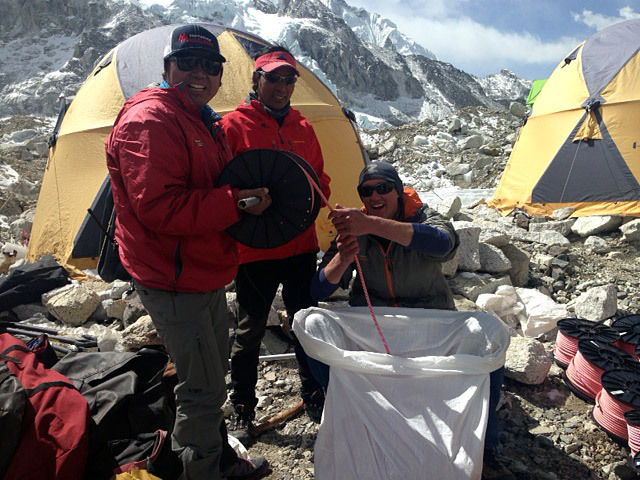 Phunuru, Ang Pasang, Kaji and the sherpas up at Base Camp are all done packing up. 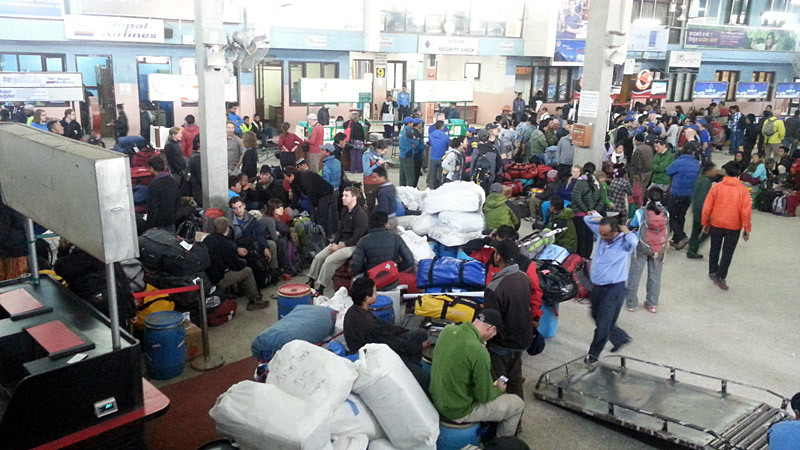 Some of our IMG climbers remain in Kathmandu but most are heading for home via different routes. The last of the guides (Justin, Max, Austin, Luke) are still stuck in Lukla (the weather has been bad the last few days, with only a few flights getting in), so we will not relax until everyone is off the hill. The flights out of Lukla are all very full now, as climbers come streaming down from Everest. Today we managed to get a group of our climbers out from Lukla on a Cessna 208 charter flight and Jangbu says that for tomorrow Tara Air has 25 flights, Sita Air and Simrik Air have 4 flights each, and Nepal Airlines has 2 flights scheduled from Lukla... all of them fully booked with confirmed passengers including some of our team members! Our final team of IMG climbers, with Justin, Max, Luke, and Austin are now in Namche and will hopefully get to Lukla tomorrow. 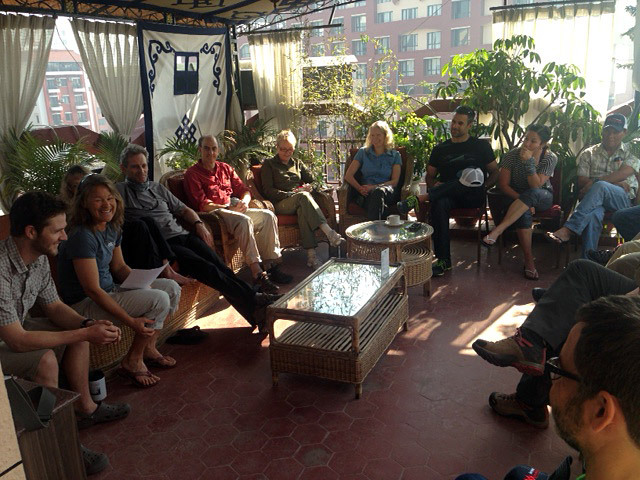 Now back in Kathmandu, (they hitched a ride on a helicopter yesterday,) IMG leaders Greg and Jangbu had a meeting with legendary Himalayan historian Liz Hawley. It is always great to see Liz out and about these days. 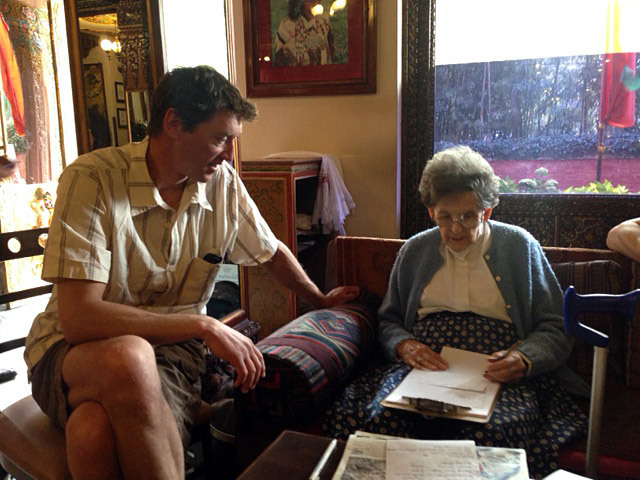 The results of her many decades of work is published in the Himalayan Database. 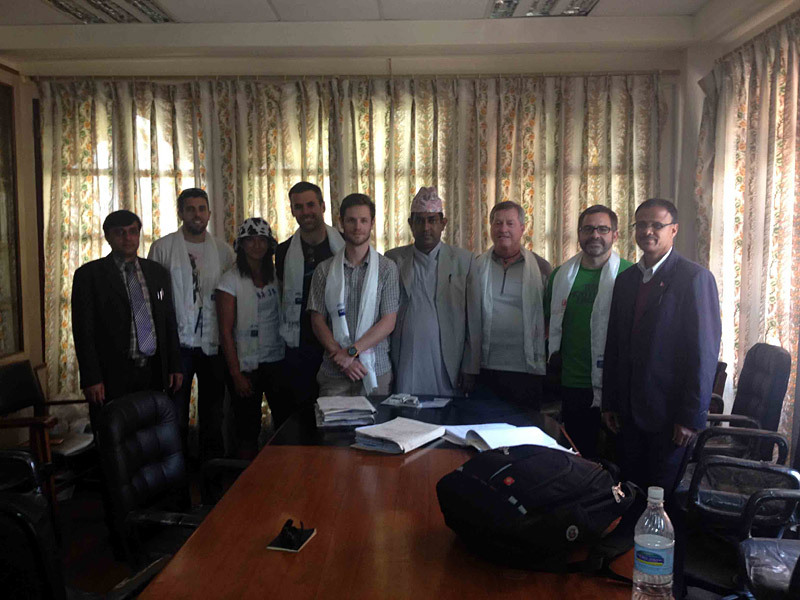 Also in Kathmandu, the various Everest expedition teams and their Nepal agencies have been working with Dambar Parajuli, the president of EOA, on drafting requests for the Nepal government for the issues I mentioned yesterday. Since he got off the mountain, IMG guide Mike Hamill has been busy with his writing, and he managed to crank out a story for the Wall Street Journal. We appreciate his thoughtful analysis of the events of the past days. After the Icefall tragedy, many of our IMG friends have asked me about recommendations for supporting the Sherpa community. It seems that these days there is no shortage of "Sherpa funds" to choose from, so it is a little confusing. For many years IMG has been proud to work with the American Himalayan Foundation. Norbu Tenzing and his staff at AHF have worked in Nepal for decades, and they have a reputable organization with solid local partnerships already established. I have no qualms suggesting that if you are looking to make a donation, the AHF Sherpa Family Fund is worth your consideration. 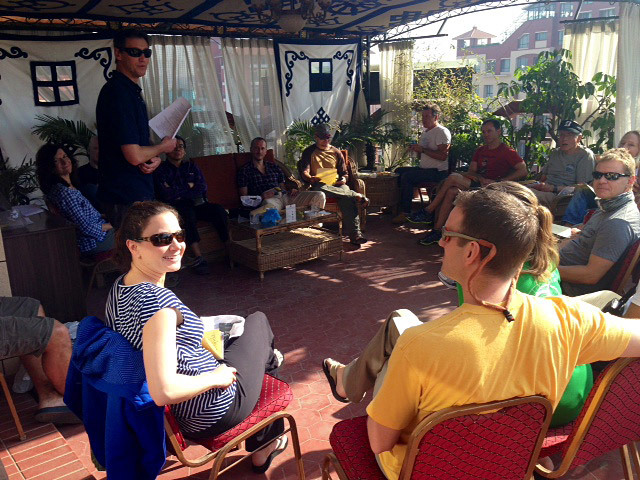 Many of our IMG team members have now arrived back to Kathmandu, though we have a few still hiking out. Yesterday we chartered the Cessna 208 and managed to fly 28 duffel bags out to mitigate a big duffel bag backup in Lukla. 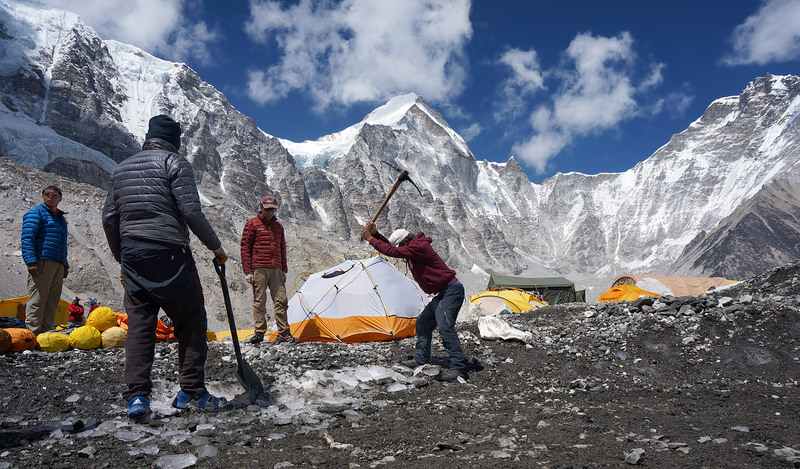 Up at Base Camp, Ang Pasang and Phunuru are spearheading a crew of ten sherpas working on packing up the camp and expedition gear. They will be leaving two of our cook staff, Nima Kale and Fura Sherpa, up at EBC to await the arrival of our Sherpa Trek team (who are getting ready to fly to Lukla on Wednesday). There are a number of very important meetings scheduled this next week in Kathmandu which will address some outstanding issues. The EOA (Expedition Outfitters Association, which represents the local agencies) seeks clarification from the Ministry on the status of the royalties (permit fees) paid to the government. 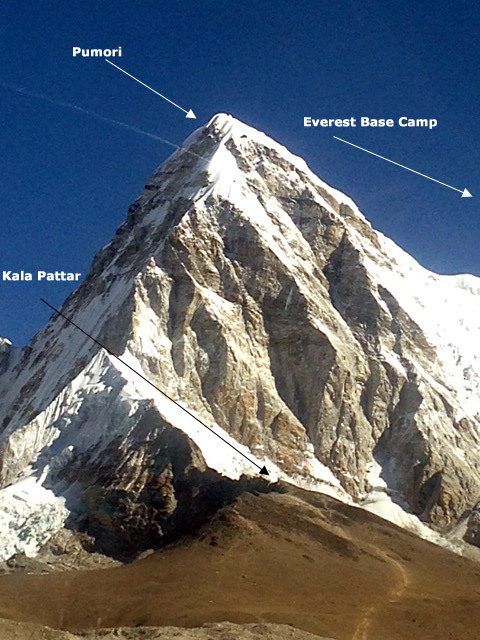 The Ministry has tentatively said that permits will be "extended for 5 years," but it is unclear as to whether this means that the individual climbers can come back any time in the next 5 years and not have to pay permit fees again, or whether it is only the teams as constituted in the 2014 permit documents that would be eligible. Other questions involve the garbage deposits, customs deposits, Icefall payments to SPCC, payments to EOA for fixed rope, use of helicopters in the future to go to Camp 1, and other issues. It is going to take a while to sort it all out! Long day today for us here. 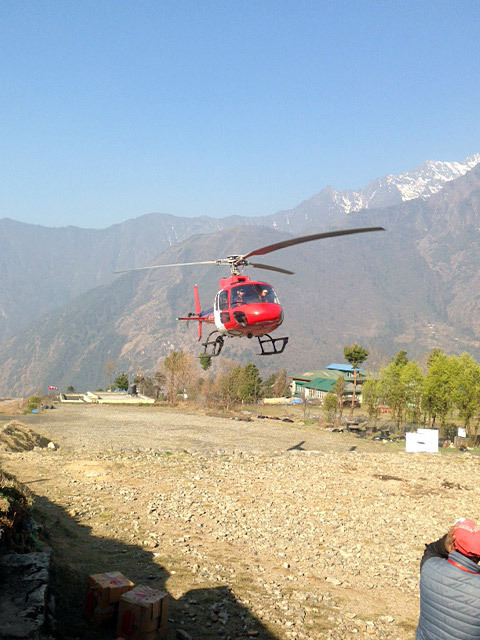 Starting early morning, we had two Simrik Air B3 Helicopters working out of Base Camp and making laps between Base Camp / Camp 1 / Camp 2. 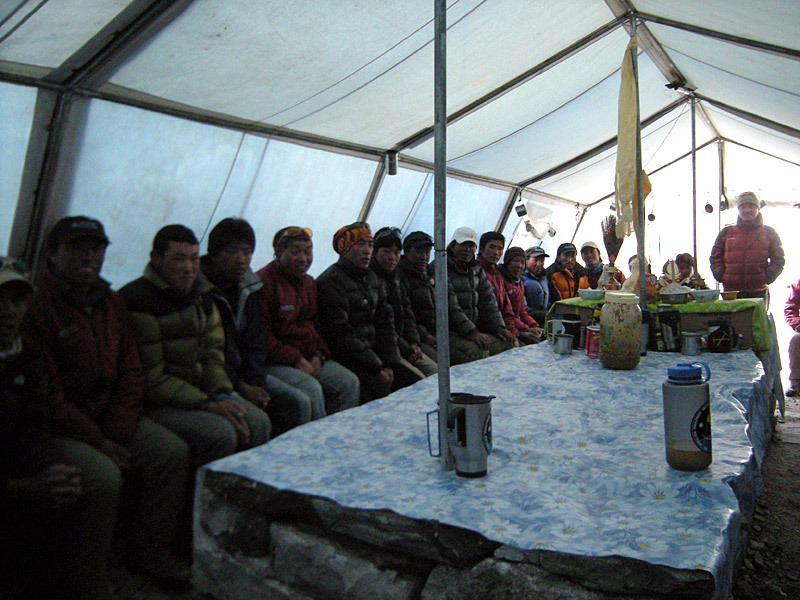 First they took 13 sherpas to Camp 2 and 6 sherpas to Camp 1. We sent Phunuru and Chewang to Camp 2 and Kami and Karma Rita to Camp 1. After a couple of hours, both helicopters went up to get gear and people back down. We brought everything down from Camp 1 including tents, oxygen, kitchen tent, propane, stove and the member personal gear for the Hybrid groups. At Camp 2 all the gear has been packed nicely and stored from six teams together: IMG, Himex, AAI, Adventure Consultants, Jagged Globe, Peak Freaks. In what may be a precedent-setting move, the Ministry has now granted permits for gear flights to the Western Cwm. 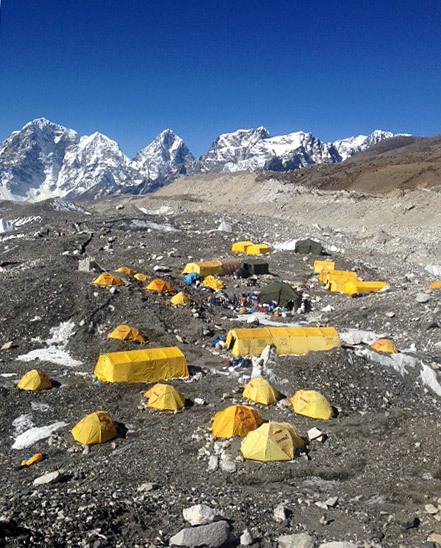 IMG has teamed up with seven other Everest teams to charter a B3 helicopter tomorrow to insert a team of sherpas at Camps 1 and 2. 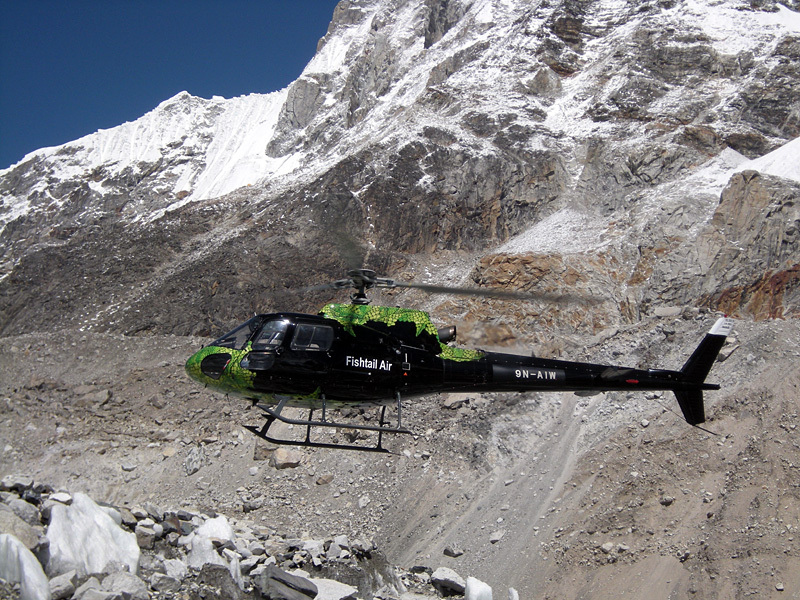 There are now four companies in Nepal that operate this more powerful turbo-charged version of the AS350. 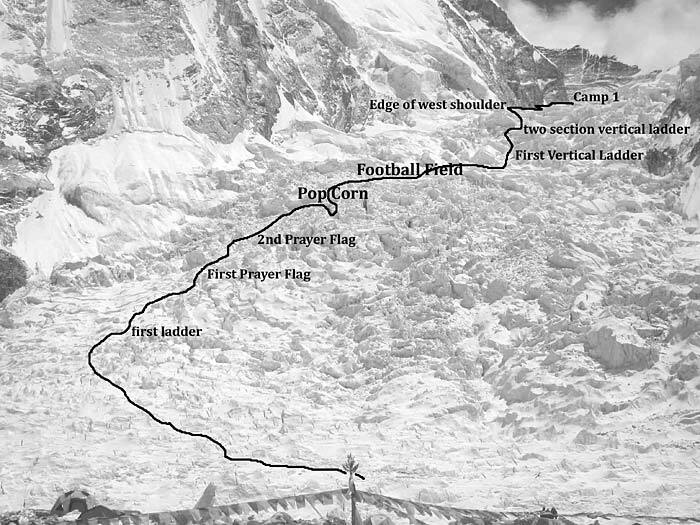 For IMG, we plan to send Phunuru and Chewang to Camp 2 and Kami and Karma Rita to Camp 1. 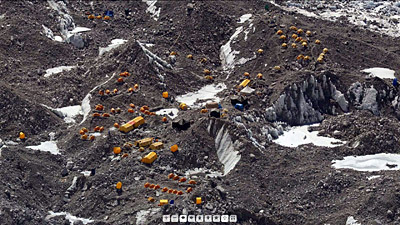 Their mission will be to finish dismantling those camps and get all the gear either sent down to Base Camp by helicopter or secured for next year's climb. The maximum payload for one flight to/from Camp 1 will be about 200 kilos and to/from Camp 2 will be about 100 kilos, depending on the fuel load, temperature, wind, and ultimately the pilot's discretion. Sounds like the pilot is initially planning to land at the camps and have the gear loaded on board (as opposed to sling-load the gear)... but this may change depending on how it goes. 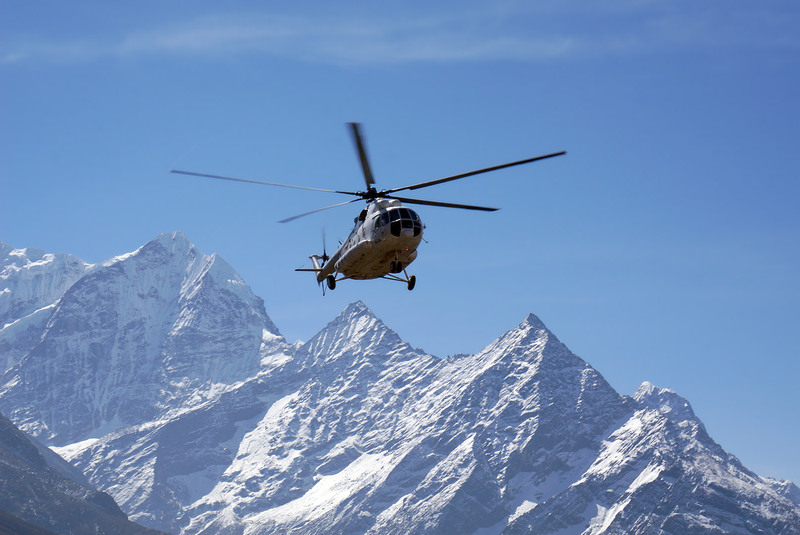 The first attempt to use helicopters on Everest to avoid the Icefall was with the Italians in 1973. Since then the capability of the helicopters has become so much better, leading to the landing on the summit in 2005 by French pilot Didier Delsalle in an AS350 B3. 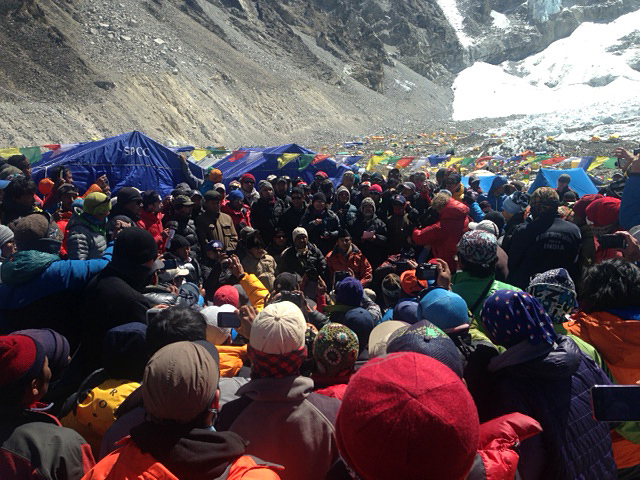 IMG leaders Greg Vernovage and Ang Jangbu Sherpa report from Everest Base Camp that there was another big meeting up at the SPCC camp today, with representatives from the Ministry flying up to attend (and then leaving immediately before they got altitude sick). Bottom line is that most teams are now departing, and it seems unlikely that any climbers will continue the ascent. 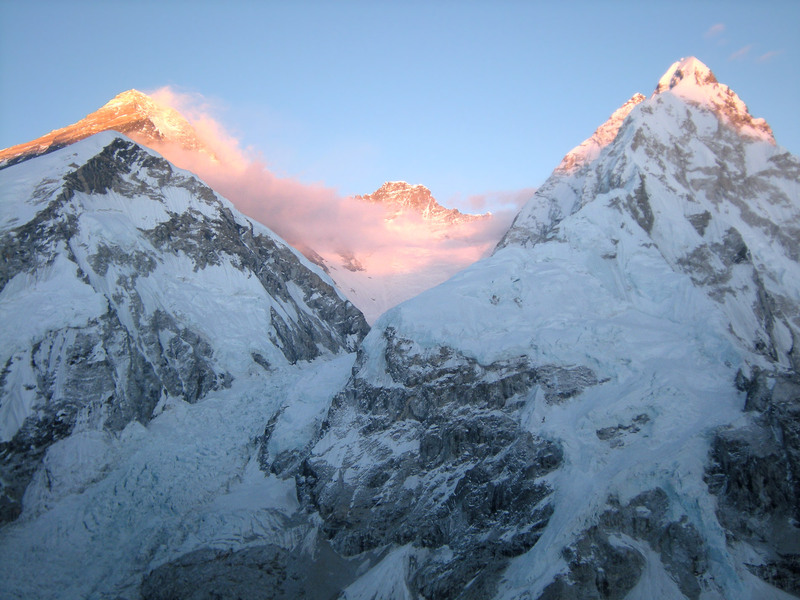 Right now our focus is getting our team members safely out of the Khumbu. 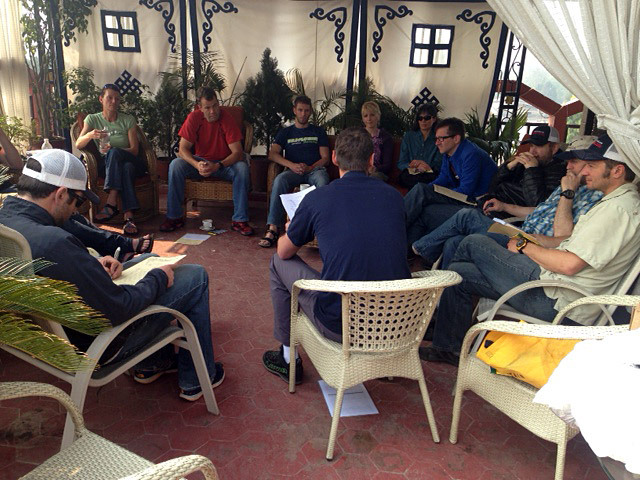 Many of the IMG team have now departed Base Camp, and the last team members will depart tomorrow morning. 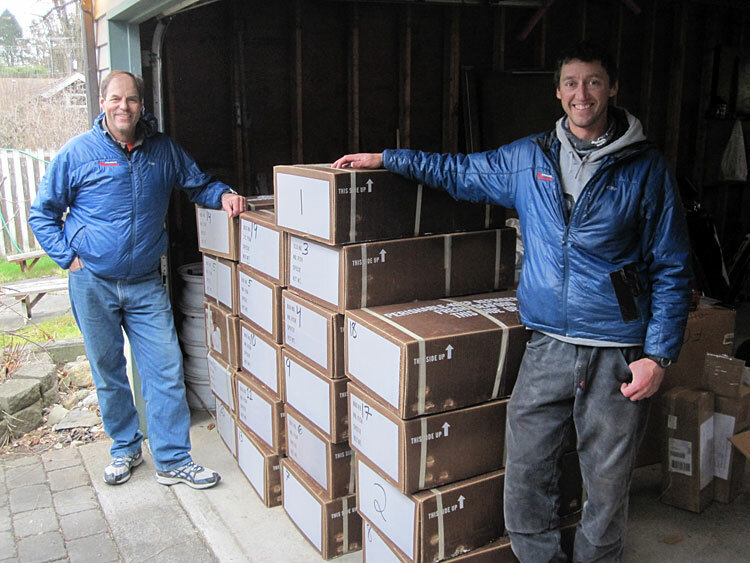 Greg, Jangbu, and our sherpa team will be staying at Base Camp for the near future, as they try to get the thousands of pounds of expedition gear organized and the camp disassembled. One of their important tasks is to figure out what to do about the 200 plus loads of equipment that were carried up to Camps 1 and 2. We may be able to use a helicopter to recover some of this gear, or at least get some people up there to secure it. Unfortunately the helicopter is an imperfect solution to the Icefall issues, since the engine horsepower and cargo capacity are so greatly diminished at these extreme altitudes. We'll keep you posted on how this develops. 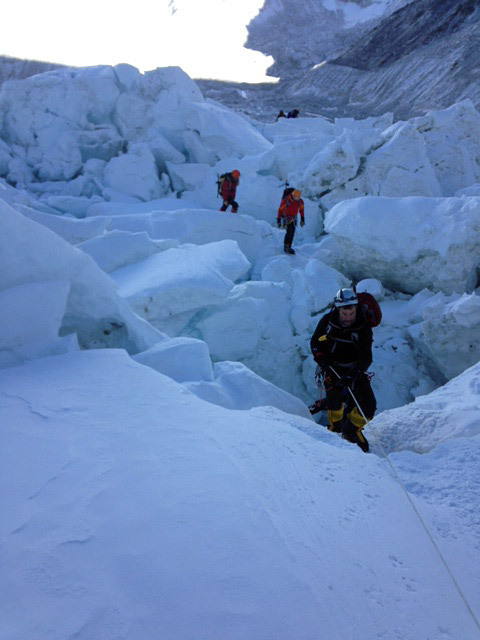 IMG leaders Greg Vernovage and Ang Jangbu Sherpa have been forced to end the expedition due to the perilous conditions resulting from the April 18 Icefall avalanche. 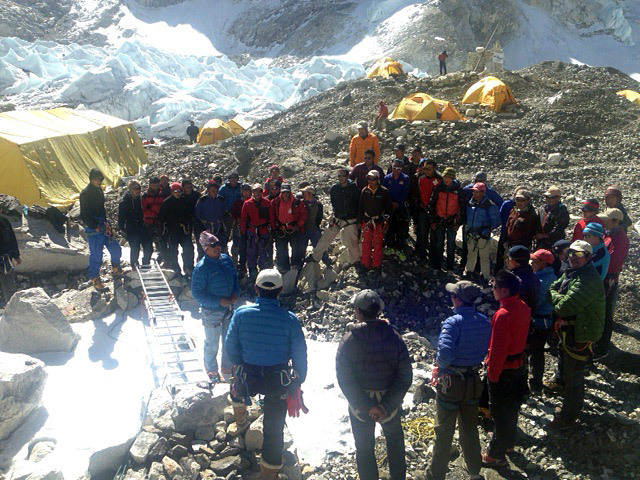 After several days of intense meetings at Base Camp and in Kathmandu among climbers, sherpas, and representatives from the Ministry of Tourism, no agreement was reached on restarting the 2014 Everest climbing season. 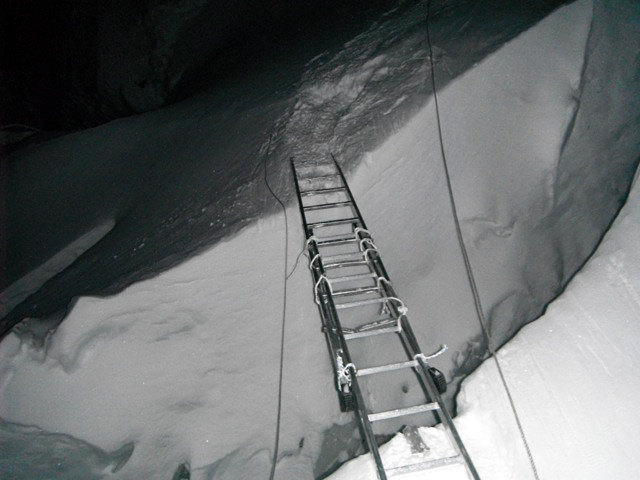 The Icefall route is currently unsafe for climbing without repairs by the Icefall doctors, who will not be able to resume their work this season. We have explored every option and can find no way to safely continue the expedition. The IMG team will be starting down valley in the next few days, with some trekking and some hitching rides by helicopter. 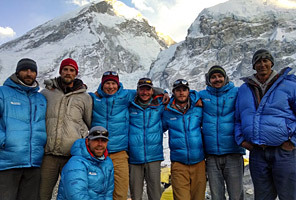 They are joined by climbers from other expedition teams that had also been waiting at Base Camp and have also been forced to end their climbs. The impacts of the big avalanche have cast a pall over Base Camp, and no climbing is taking place on the mountain. Our IMG teams are in a holding pattern, waiting to see if the expedition can restart. There have been several meetings among the various team leaders, sirdars, and sherpas but it remains unclear what the final decision will be. Some teams and climbers have decided to go home, but many are holding at Base Camp until they get definitive news, one way or the other. 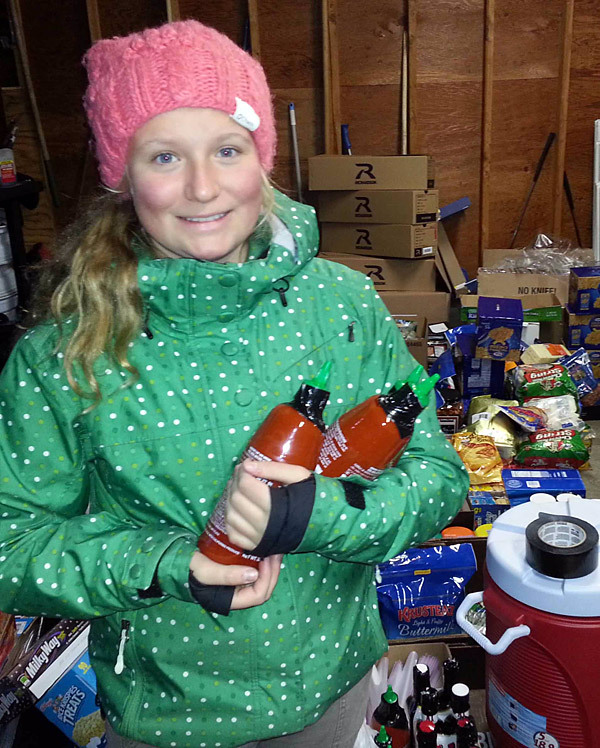 For the IMG members who have elected to remain, they are keeping busy with camp chores and doing acclimatization hikes. There is another big meeting scheduled for Wednesday at the Ministry in Kathmandu and we wait to hear the news from that. 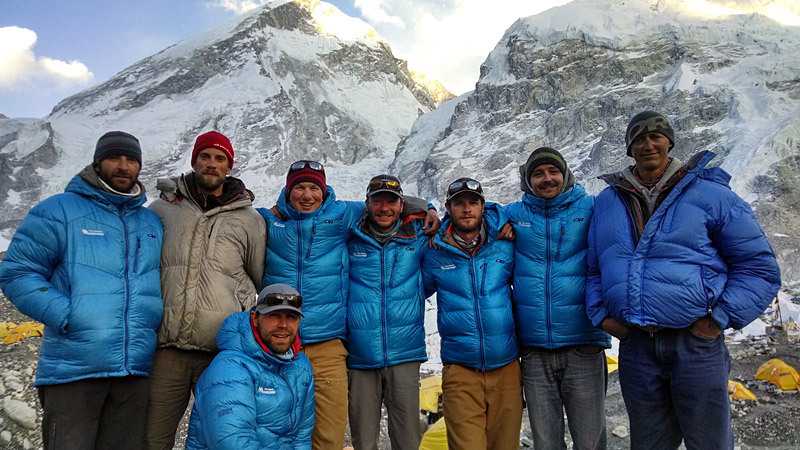 IMG leader Greg Vernovage reports that Justin, Max, and their hybrid team and sherpas descended from Camp 2 to Base Camp yesterday. Their trip down the Icefall was somber but uneventful. The IMG team is now all in Base Camp with our cook staff. The climbing sherpas all went home to be with their families for a few days. 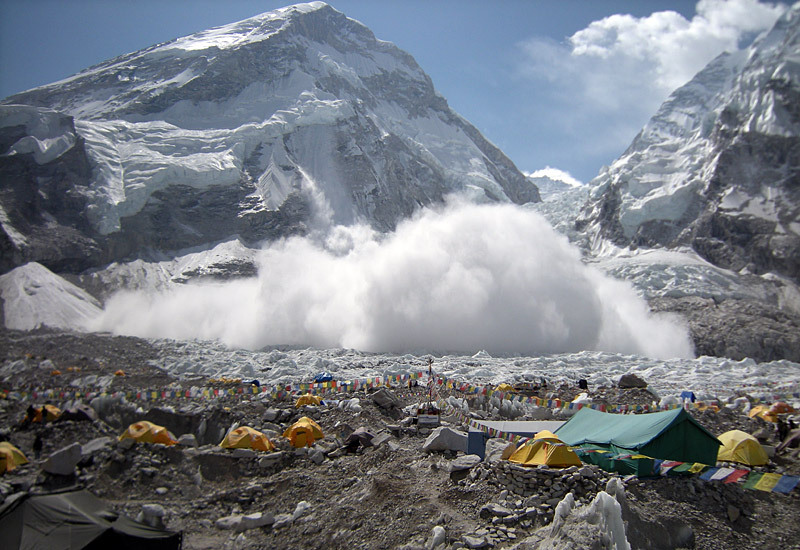 The avalanche yesterday occurred about three quarters of the way up the Khumbu Icefall, above the "Popcorn" section. The irony is that everyone was feeling pretty good about the Icefall route this year, as it had been installed this season by the icefall doctors further away from the edge of the West Shoulder in an area that is normally not so exposed to the frequent slides that come off the Shoulder. However, this ice avalanche (not to be confused with a snow avalanche) was caused by a huge chunk of ice that broke loose high up from the hanging glacier and broke into myriad chunks as it tumbled for several thousand feet, resulting in debris that came further out into the Icefall. 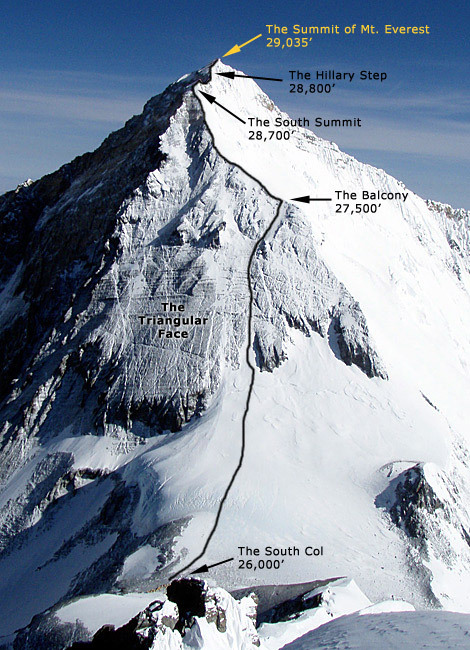 IMG guide Austin Shannon was training in the lower Icefall with some of the Classic climbers and responded uphill, while IMG guides Justin Merle and Max Bunce were at Camp 1 and descended to the scene. Together with other rescuers, these guys spent many hours today on scene rescuing the injured and recovering the dead. We were fortunate that only one member of our IMG team was injured. IMG's Kami Sherpa (from Kerung, not to be confused with Kami from Pangboche) was hit hard on the leg by a chunk of ice, and we had him flown to Kathmandu by helicopter for examination/treatment. Pasang reports that X-rays show his leg is not broken, so that is a small bit of good news in an otherwise very sad day. I spoke to our expedition leaders Greg and Jangbu, and they report that all the various teams have agreed to stay out of the Icefall for two days to allow the icefall doctors time to get back up and rebuild the climbing route. Also, there are still several sherpas unaccounted for and search/recovery efforts will continue for them in the morning. 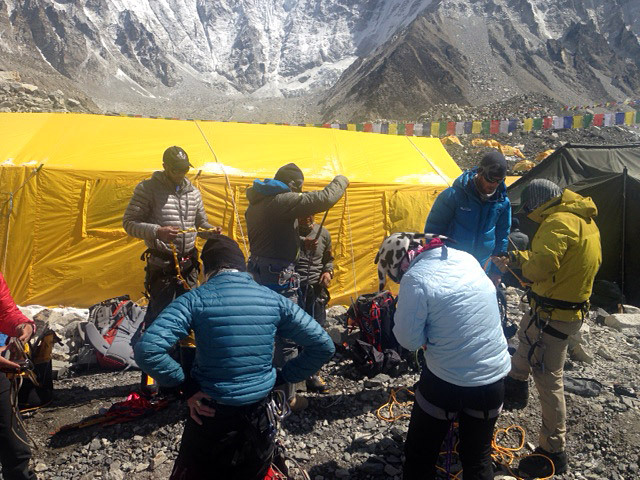 With the exception of Justin and Max (who re-ascended to Camp 1 after their effort with the rescue) and their team up there, all the rest of the IMG team is at Base Camp. 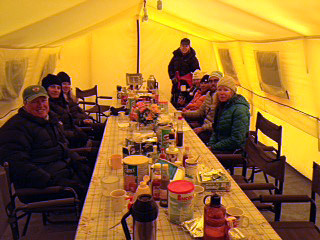 Justin/Max and their team will continue up to Camp 2 tomorrow where we have a camp all set and waiting for them. The overall plan for IMG is to continue the expedition once everything gets sorted out. Each climber will need to assess their personal tolerance for risk and make a decision. As a wise old climber once told me, we may love the mountains, but they don't love us. Mt. 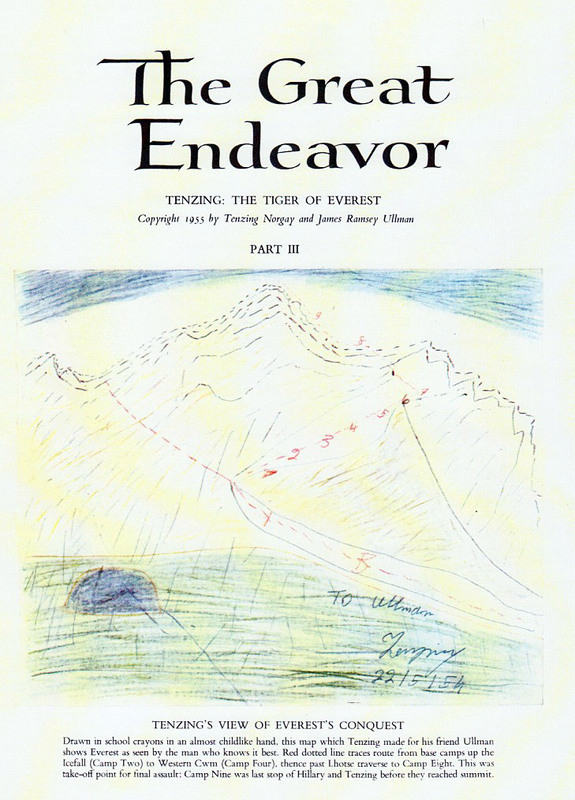 Everest is the same today as it was yesterday, and as it will be tomorrow. 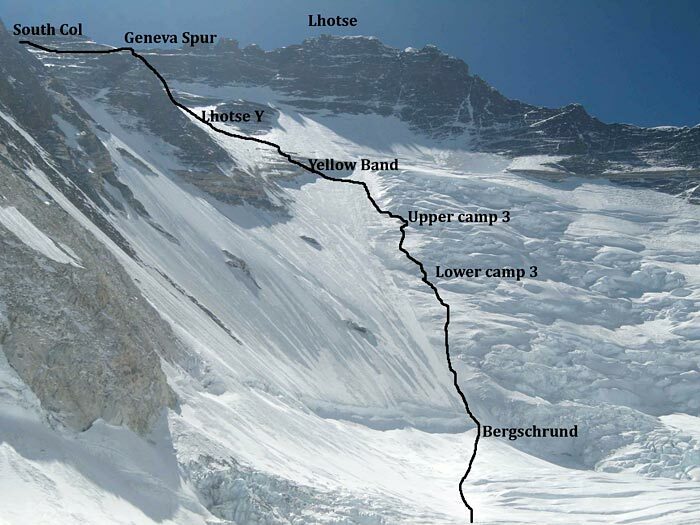 IMG leader Greg Vernovage reports that an ice avalanche started from high on the West Shoulder and swept down into the Icefall this morning (Everest time) below Camp 1. It sounds like we had one IMG sherpa suffer a leg injury. 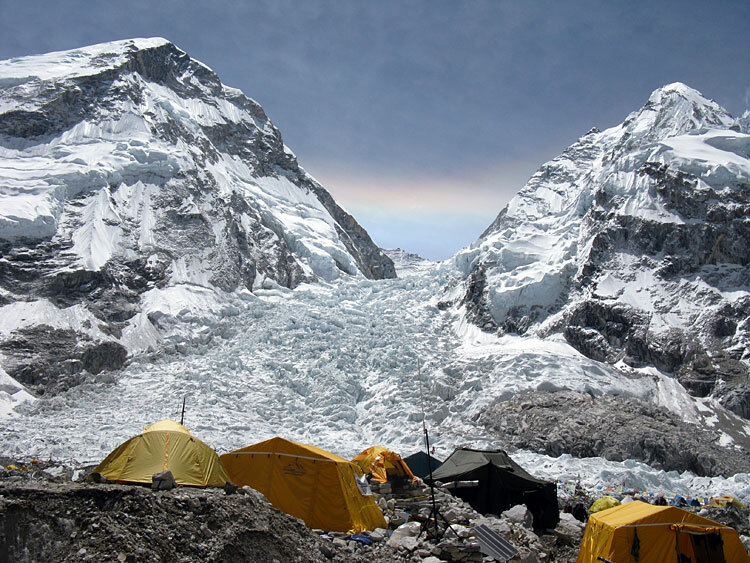 All other IMG members and sherpas are OK.
IMG Leader Greg Vernovage reports that Justin, Max, and the first hybrid team are ensconced at Camp 1 after a good climb up the Icefall. 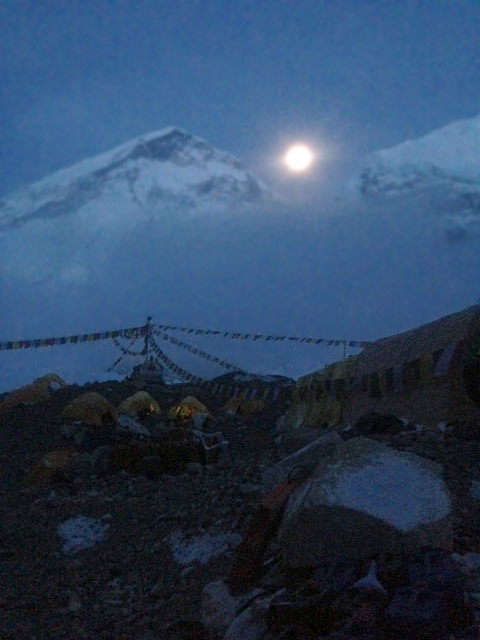 We have 11 sherpas sleeping up at Camp 2 tonight to continue work on that camp. 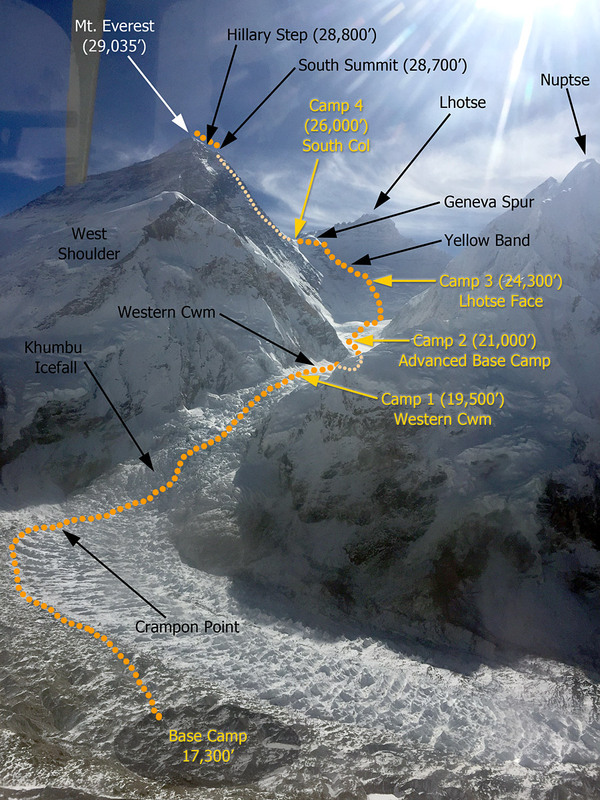 Tomorrow we have seven sherpas heading up to Camp 1 to help move the members' gear to Camp 2, and another five heading up to Camp 2 on a carry. 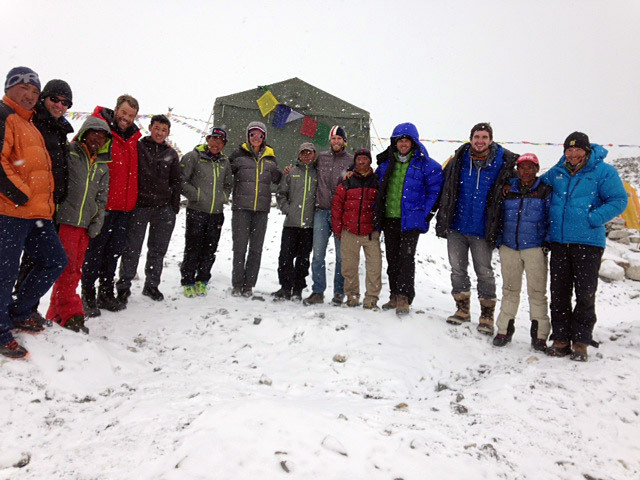 At Base Camp, guides Andy, Phinjo, and the second hybrid team had a good acclimatization hike today to Pumori. The Classic climbers have now settled in and are proceeding with their training and acclimatization (including yoga!) Today Greg and our staff worked with several other teams to prepare the fixed rope, which was purchased this year for EOA by Henry Todd (from Beal). They got it all stripped off the spools and bagged up, so it does not get kinked while deploying. All total they have 10,000 meters of rope (in 100m and 200m sections), along with 100 pickets, 100 screws, and 100 carbineers stashed in a central location up at the Adventure Consultants camp, ready to move up the hill for fixing the Lhotse Face and above. Tomorrow the various teams will get together for a rope fixing meeting and to split up the fixing gear (all total about 50 loads) for carrying it to Camp 2 in the next few days. Down at Lobuche Peak, IMG guides Jenni and Luke report 100% on the summit. 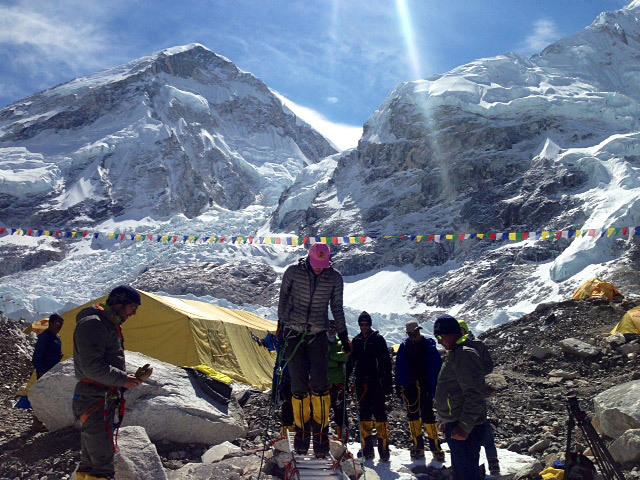 Sounds like they had a nice climb and wrapped up our Lobuche program in style. Way to go, team! They will take a rest day tomorrow before the Lhotse climbers head back up to Everest Base Camp and the Lobuche climbers head down valley. 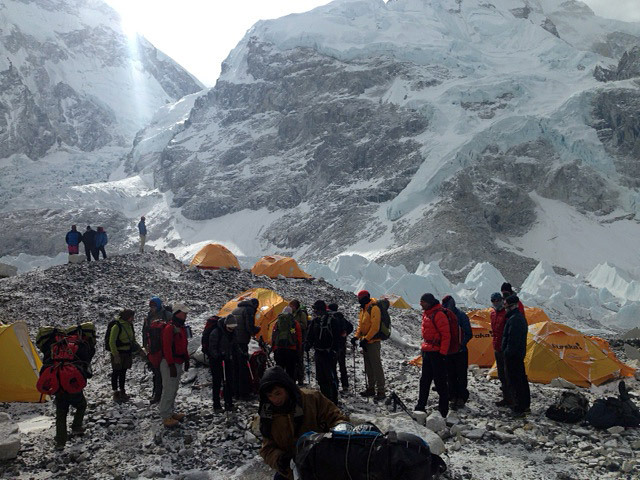 All sherpas carrying to Camps 1 and 2 made it OK. 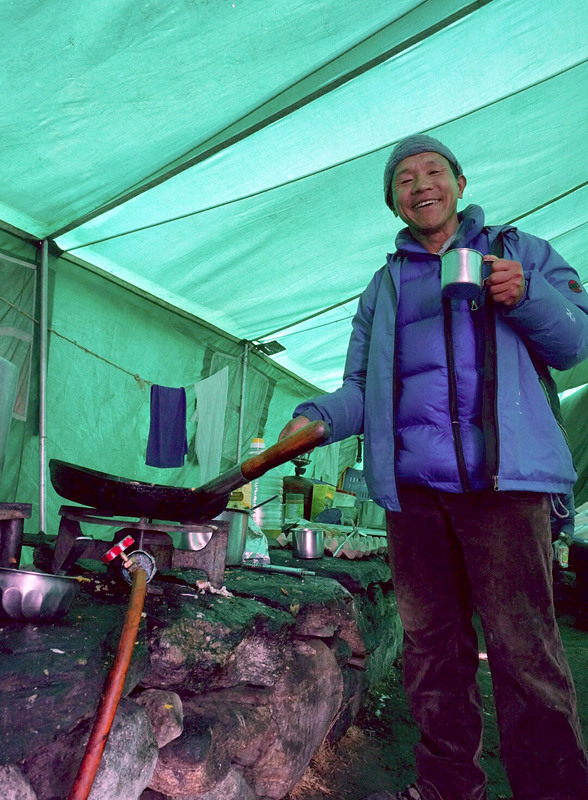 The sherpas who went to Camp 1 managed to set up the kitchen tent plus seven sleeping tents. At Camp 2 they were able to set up the big steel frame tent. We have Ang Karma, Nuru Gyalzen and Ang Nima staying up there at Camp 2 tonight. Phunuru sent his camera with Ang Karma to take pictures, so we will send some when he comes down in a couple days. 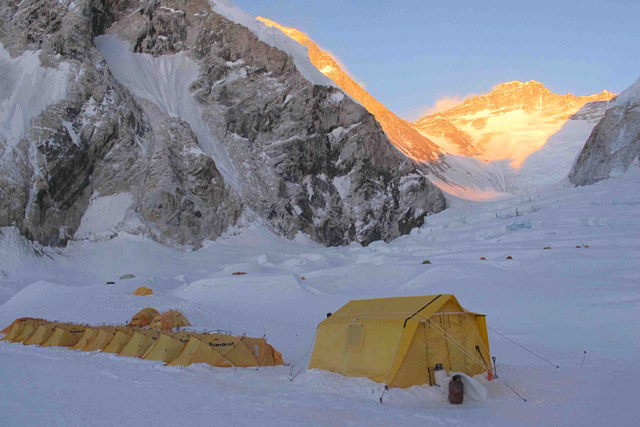 The schedule for tomorrow has guides Justin, Max and their hybrid climbers and sherpas going up to Camp 1 to sleep. We are sending five more sherpas to Camp 2 tomorrow for building platforms and setting up more tents, and they will stay up there. 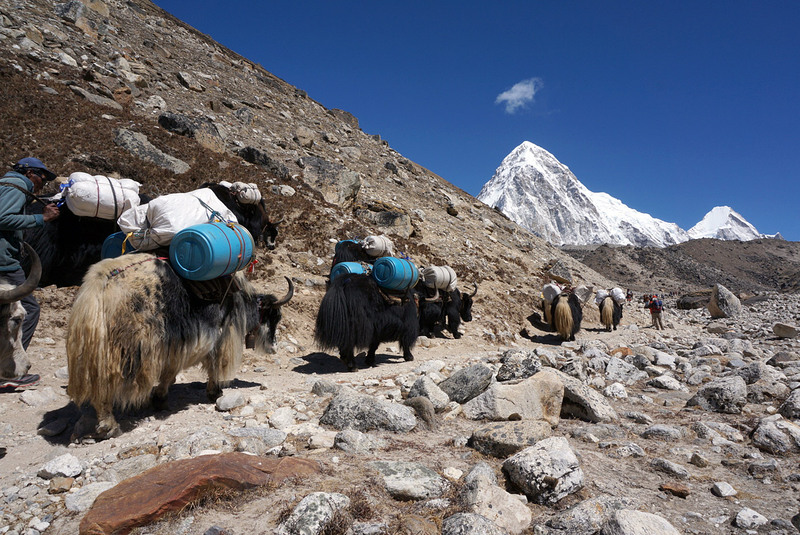 Tomorrow, we have 22 sherpas carrying loads to Camp 2 and nine sherpas are carrying member personal gear to Camp 1. 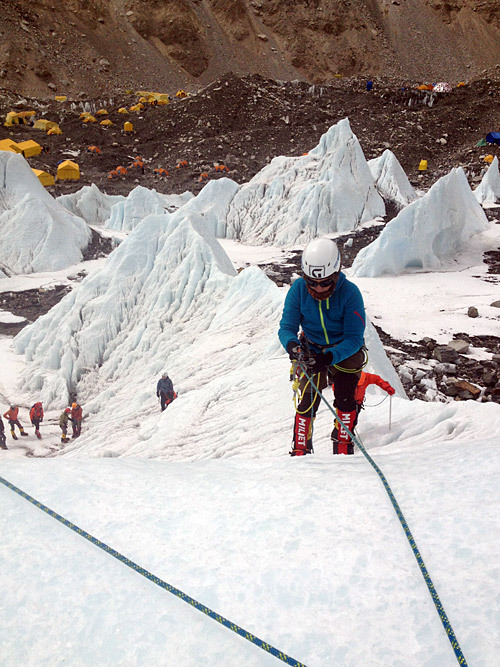 Greg, Austin, and the rest of their Classic team are back to Everest BC now from Lobuche Peak. Andy and Phinjo and the second Hybrid team are hiking up to Pumori Camp tomorrow for acclimatization. Today Jenni and Luke and their crew moved up to Lobuche High Camp, and they are planning to depart about 3AM for the summit. Today the EOA fixed rope for the upper mountain arrived to Base Camp, and we will be meeting with the other teams to work on the fixing plan. However, no other teams have moved to Camp 1 or Camp 2 as of today. Ang Jangbu reports from Everest BC that the 11 IMG sherpas who carried to Camp 2 today led the way with some trail breaking along the way. The main contingent of our sherpa team took a rest day, but tomorrow they will be back at it with ten men carrying to Camp 1 and forty to Camp 2, so those camps are almost ready. We also have three cooks moving up to occupy Camp 2 tomorrow, to finish whipping that camp into shape. Once we start erecting many tents up there, it is important to have staff staying there in case a strong windstorm comes up, and tents come loose from the anchors. 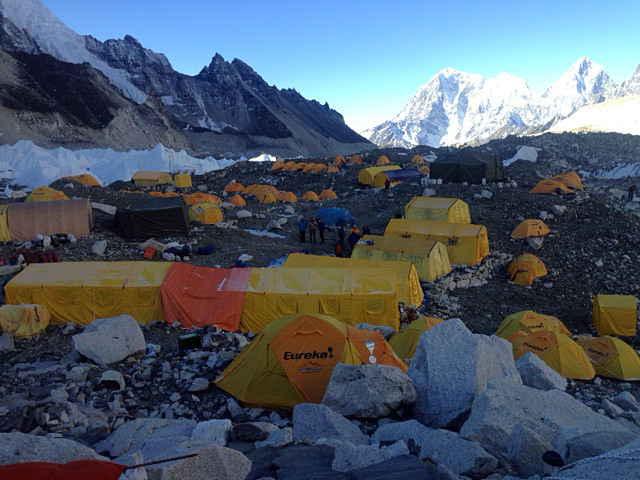 Down at Lobuche Peak Base Camp, Greg Vernovage reports that his team will move up to Everest BC in the morning tomorrow. Also tomorrow, Jenni, Luke, and their team will move up to High Camp, for our final ascent of Lobuche Peak. 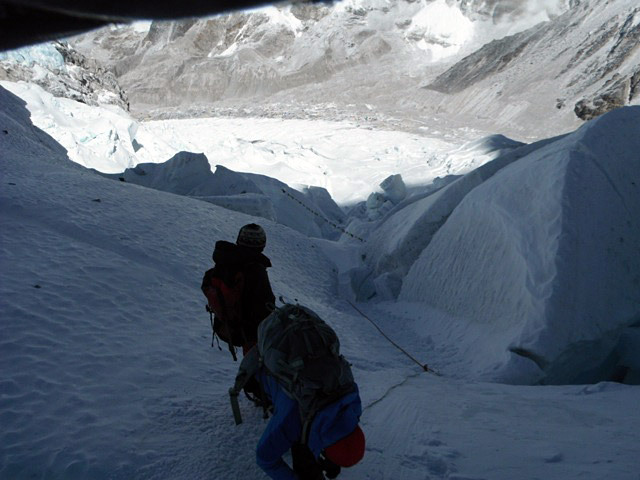 As the climbers return to Everest BC from Lobuche Peak, thoughts turn to the Khumbu Icefall and the challenges to come. 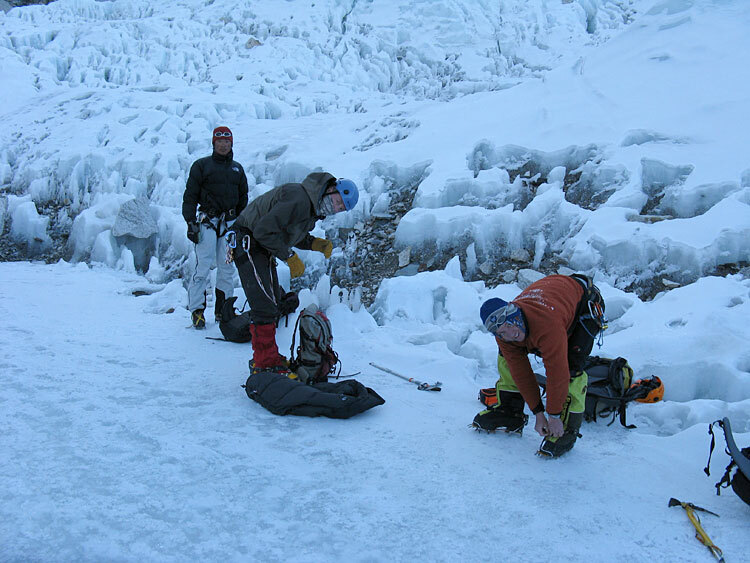 We want our climbers' first trip up the Icefall to Camps 1 and 2 to be successful, so we have been working with them on a good mix of strenuous climbing, technical training, and acclimatization to accomplish the objective of thorough preparation. 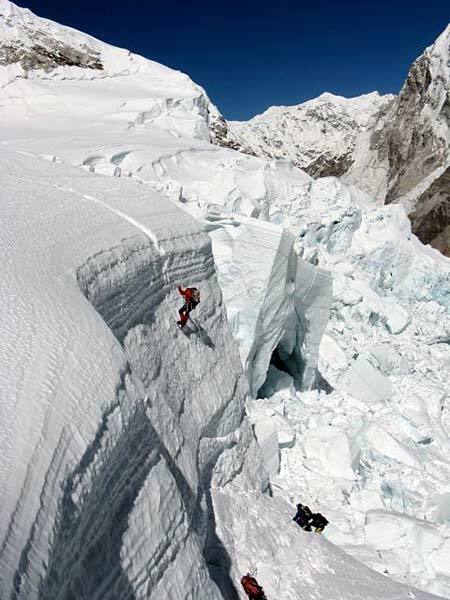 IMG guides Mike Hamill and Geir, with Andy Polloczek, Phinjo and the Hybrid team climbers, made a run up into the Icefall today as far as the Football Field (about halfway) to practice on the ladders, before returning to Base Camp. Next up for them are a couple well deserved rest days before their big move up to Camps 1 and 2. Also today, two time Everest summiter David Pastor and Kancha Nuru tagged Camp 1 and returned with some good photos of the route in the upper Icefall. 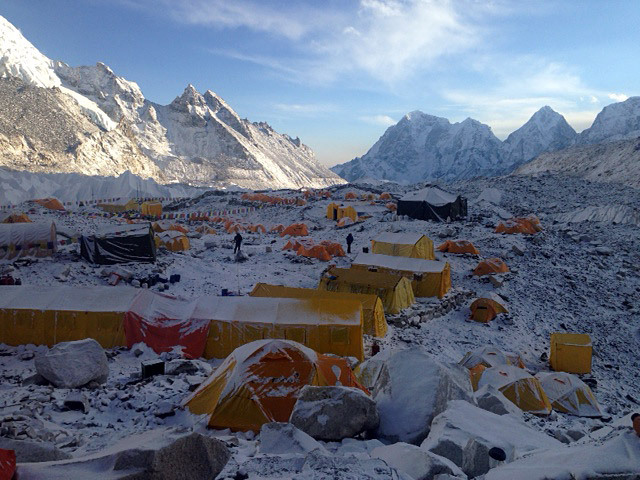 Ang Jangbu reports from EBC that Justin, Kami, and the first Hybrid team made a practice run up the Khumbu Icefall to the Football Field today and then returned to Base Camp just in time for an afternoon snowstorm. 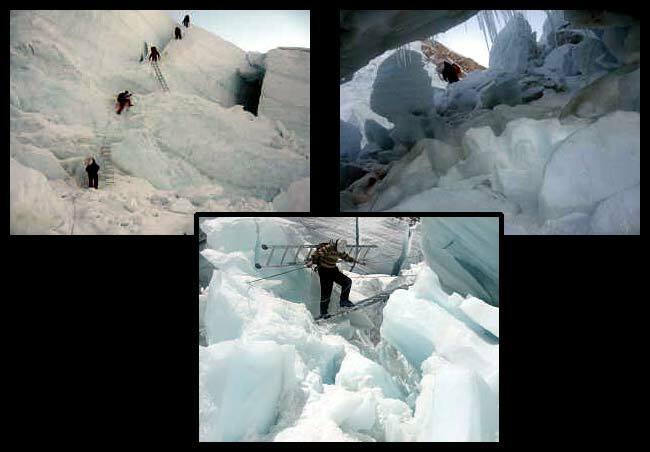 This was great practice for the team with crossing the ladders and moving swiftly throught the jumble of ice blocks. 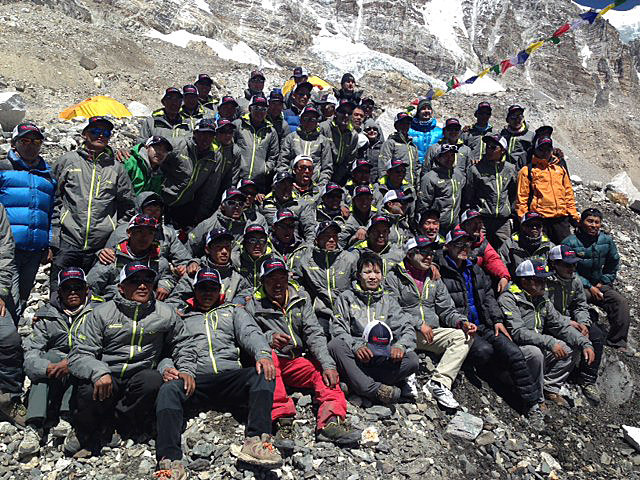 All 42 of the IMG sherpas carrying today made Camp 2 and returned to BC. 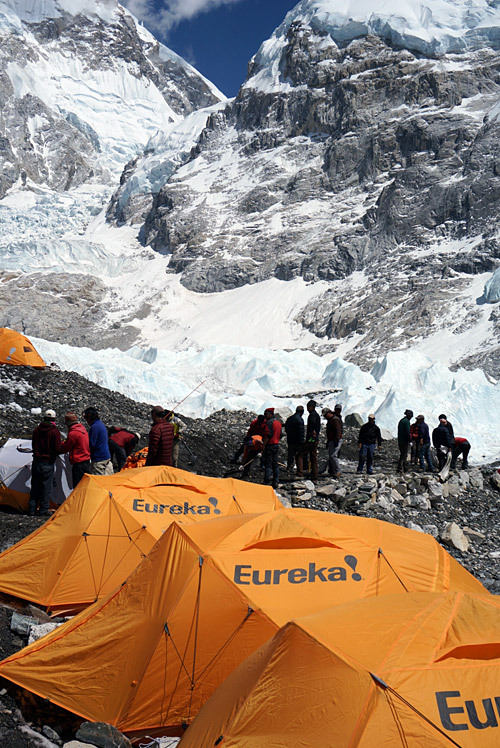 We have 12 sherpas carrying to Camp 2 tomorrow, and the rest of the Sherpa team will take a rest day. Karma Rita reports that the Icefall was busy today with many teams starting to move gear up the hill. Two of our trekkers, Mitch and Dalton (who were with Jenni and Luke) decided to fly out of Base Camp rather than hike out, so Pasang organized an early morning helicopter for them. 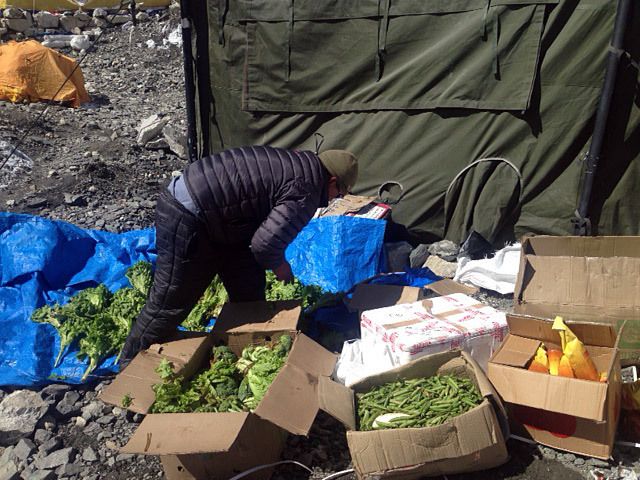 Before it departed from Kathmandu, Pasang managed to load a couple boxes of fresh vegetables for the Base Camp kitchen. Good job on the trek, Mitch and Dalton, and thanks for the vegetables! 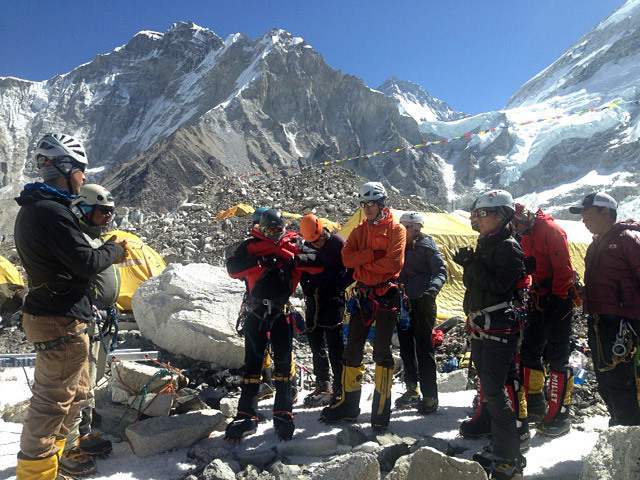 Luke, Jenni, and Phunuru trained on the ladders and ropes course we have set on the Khumbu Glacier with their team of Classic, Lhotse, and Lobuche climbers. Everyone is doing well in this group, and they will be heading down to Lobuche Peak tomorrow for their climb. Down at Lobuche Peak, the Classic team with Greg and Austin had a good summit of Lobuche Peak and were also hit by snowfall on the descent with several inches of accumulation. Most of the team will take a rest day tomorrow before heading back to EBC, but it sounds like some of the team are hearing the call of the showers and internet and will be heading straight up to EBC in the morning! All is well up here, and it was a big day today. 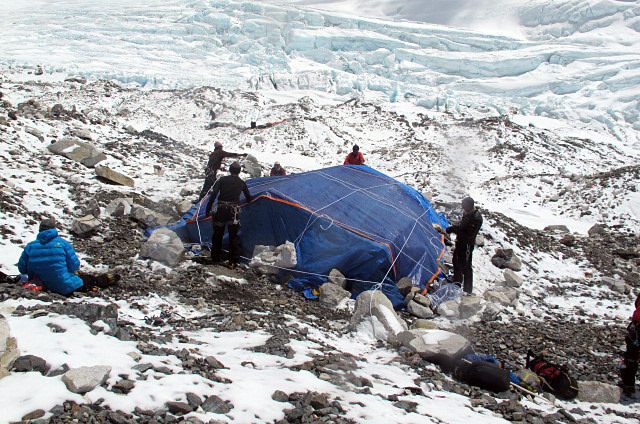 All sherpas carrying today made it to Camp 2 with loads and they managed to set up one of the big tents. We have 42 more sherpas headed up tomorrow with loads. Greg and the Classic team moved to Lobuche high camp. They plan to leave for the summit at 4AM. 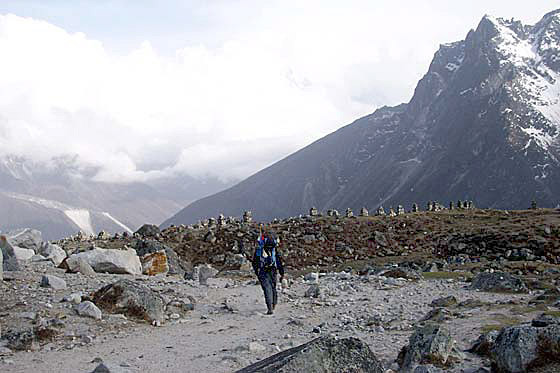 Andy, Phinjo, Hamill, and the Hybrid climbers came up from Lobuche base camp. We had the mini puja today with Hybrid climbers and Jenni/Luke's crew this afternoon. Aaron and Jim are taking a well deserved rest day down at Lobuche BC today, and are coming up tomorrow. 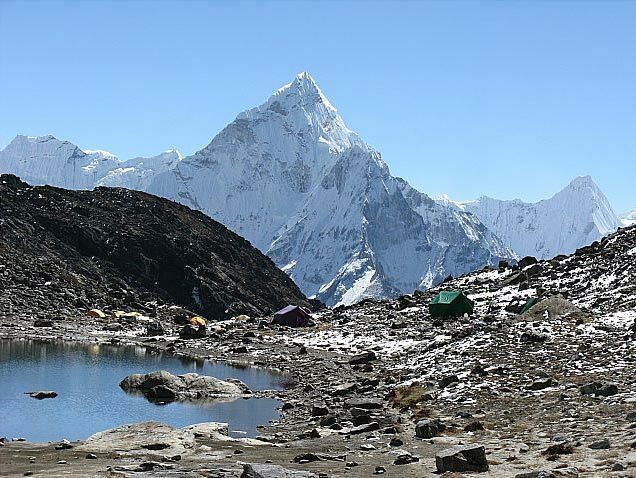 Jenni and Luke's team will train here tomorrow on Khumbu Glacier. Justin Merle and his crew plans to go for an Icefall training run tomorrow with their sherpas Kami, Pemba Dorje II and Damai Serki. We saw many other teams pulling into base camp today, and it is now getting much busier. Mercantile internet now seems to be working better, but Ncell is still down. That is about it for today. I will send you an update tomorrow. 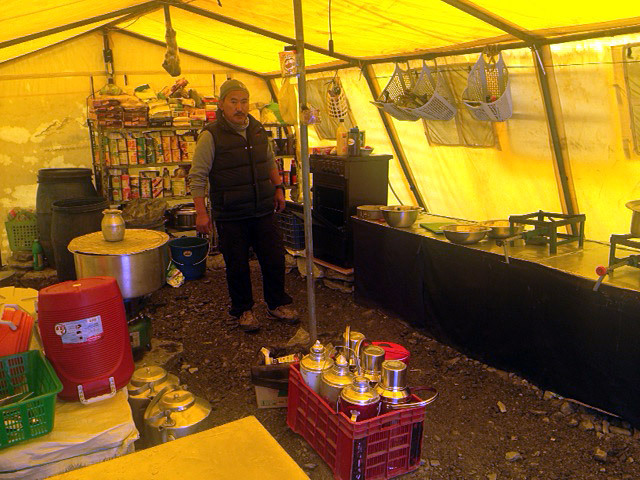 IMG leader Greg Vernovage reports from Lobuche Base Camp that everyone is movin' and groovin' down there. 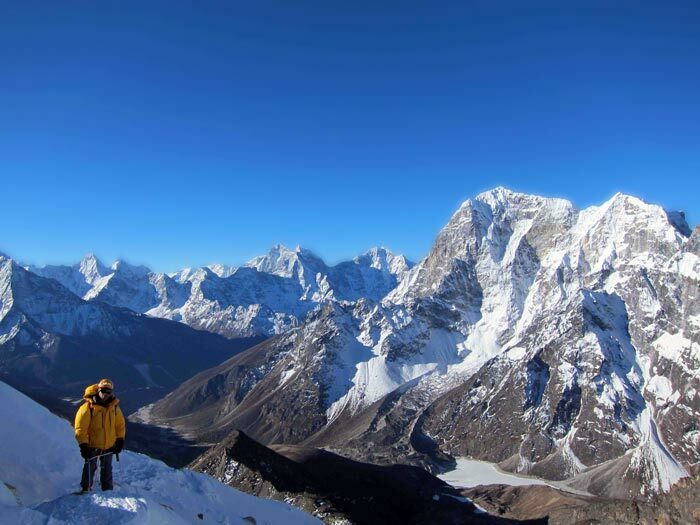 Today Aaron, Jim, Thom, Tashi and Phura Gyalzen reached the summit of Lobuche and will take a rest day tomorrow. Aaron reports that it snowed pretty hard on their descent, with several inches of accumulation. Way to go! Greg, Austin, and the Classic climbers are moving up to Lobuche high camp tomorrow. 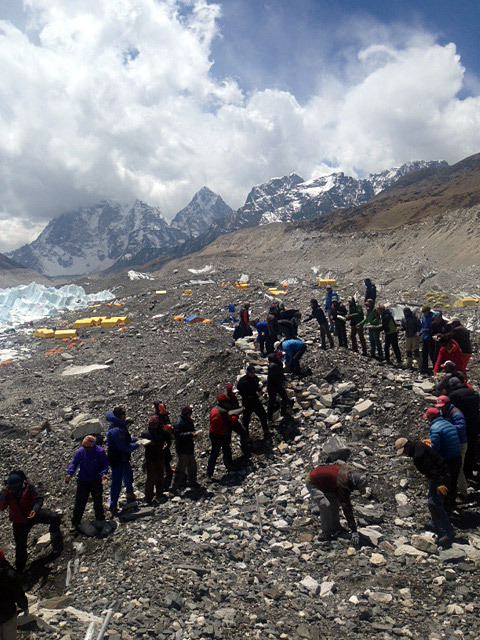 Jenni, Luke, and their group of Classic trekkers, and Lhotse and Lobuche climbers moved up to Everest Base Camp today. The patient, 12-day acclimatization schedule that our teams have used to get to Everest BC is paying off big time, and all our climbers and trekkers are doing very well, with everyone rolling into EBC feeling good. That is the way to start an expedition! 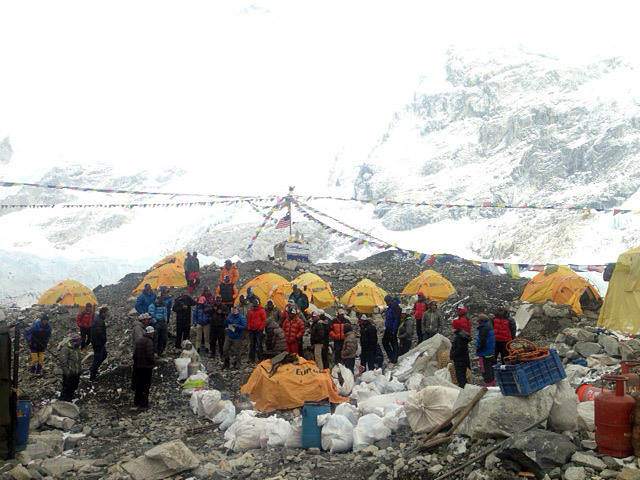 Up at Everest Base Camp, Ang Jangbu reports that it was cloudy with a bit of snowfall. 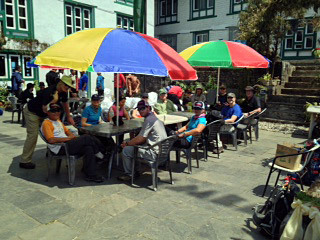 The Sherpas took a rest day today, after their big carry yesterday up to Camps 1 and 2. The route in the Icefall was slower than normal for them yesterday, since it has yet to be well established. After a few more days of use, the "trail" will improve. Jangbu says that the route goes more up the center of the Icefall this year, so is less threatened from rocks and ice avalanche coming off the west shoulder than in some of the past years when climbers were forced to the side of the Icefall by unrelenting crevasses. Tomorrow we have two of our Camp 2 cooks accompanying 56 of our climbing sherpas heading up from Base Camp to Camp 2 in the pre-dawn darkness. They will be making a "monster carry" to Camp 2 of food, fuel, tents, and supplies and will start getting that camp laid out just the way the cooks want it. 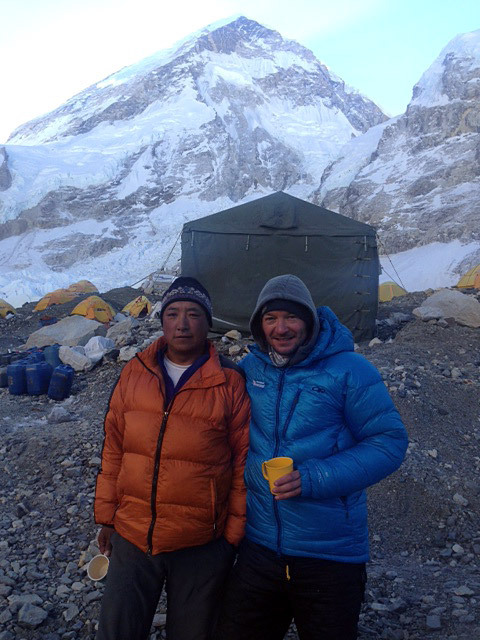 IMG leaders Greg and Ang Jangbu report from base camp that all 50 IMG sherpas made their carries today to C1 and C2, and that these camps are now well on the way to being established. These guys did a great job with their first big push up the Icefall, including having to make a re-route along the way to get around a ladder bridge which had failed. Meanwhile, the Classic climbers had a good day of training at Base Camp, with Austin and Phunuru leading the practice on fixed ropes and ladders. These climbers will be heading to Lobuche Peak tomorrow. 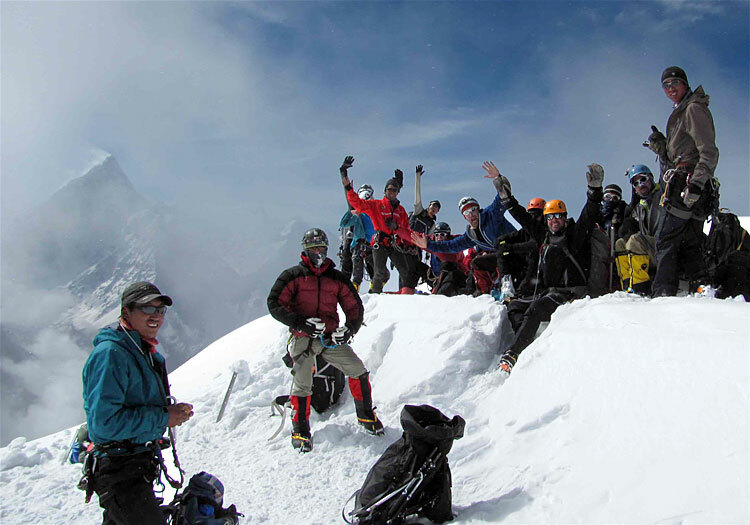 Down at Lobuche Peak, Tashi and Pasang Nuru climbed again to the summit with our second Hybrid team. Congrats to Mike, Geir, Andy, Phinjo, Ellen, Andre, Ben, Alain, James, and Brooks. They will be taking a well-deserved rest day tomorrow, before coming back to Everest BC. 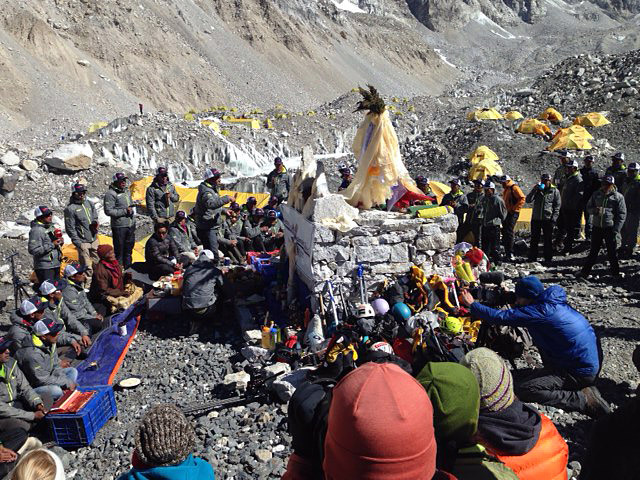 Today the IMG sherpas celebrated their big puja at Base Camp, complete with three hours of chanting, juniper burning, chang drinking, rice throwing, tsampa face smearing, prayer flag raising, and the blessing of all the climbing gear by the Lama. In short... a big party! 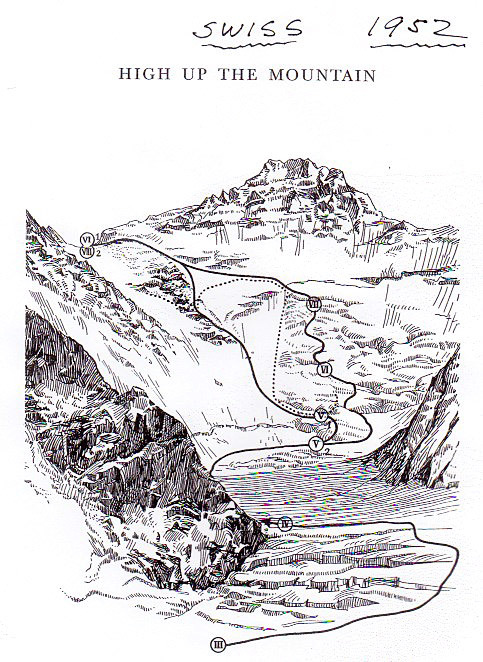 Tomorrow we'll have 50 sherpas heading uphill (18 going to Camp 1 and 32 going to Camp 2). Down at Lobuche Peak, Justin and the first hybrid climbers had a nice climb today. 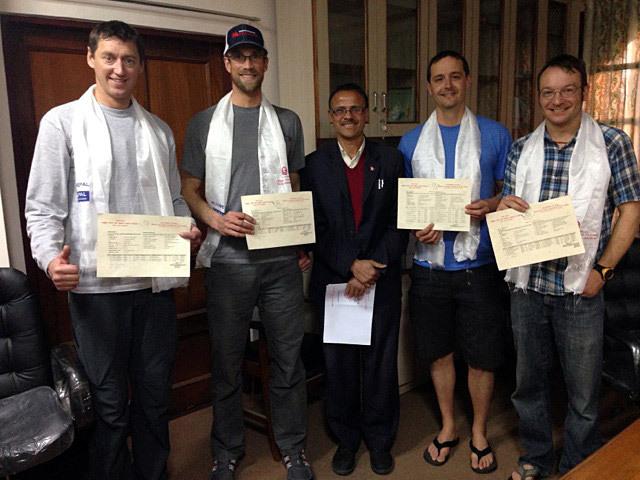 Congrats to Michele, Florian, Justin, Dan, Kami, Tashi and Mingma Tshering. Tomorrow they will take a rest day at Lobuche BC before heading back up to EBC. The second hybrid team moved up to Lobuche high camp today and they are planning a 3:30am departure for the summit of Lobuche Peak. Greg Vernovage reports that the Classic team is doing well. 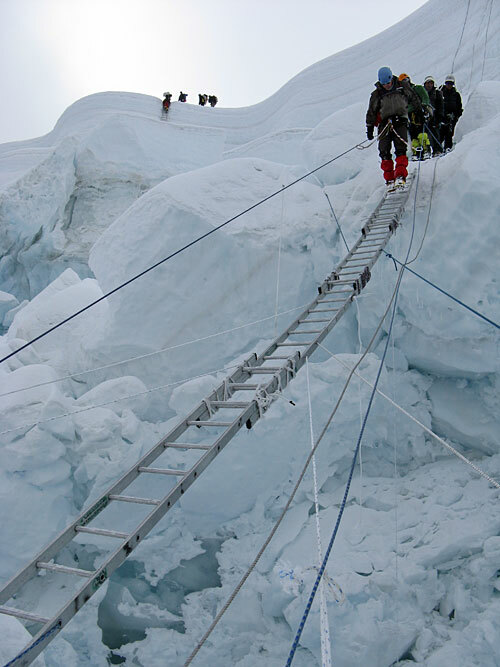 Today the trekkers hiked up to Crampon Point at the base of the Icefall, and the climbers worked to get their harnesses and rigging all set for fixed ropes. Tomorrow they are planning a big day of training out on the ice near base camp with practice crossing ladders and ascending/descending the steep fixed lines. 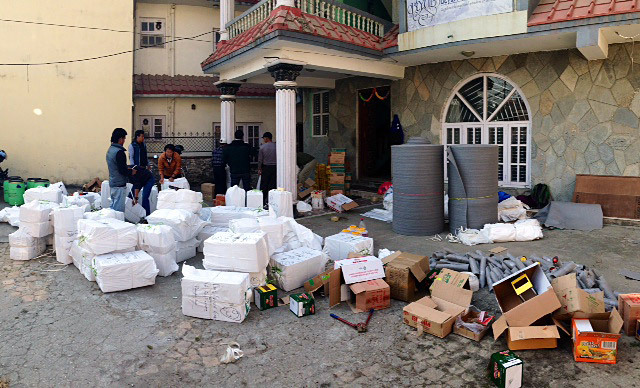 Back in Kathmandu, Pasang reports that they sent a truck to Jiri today with 71 pieces of cargo (66 loads of food and 5 additional loads of oxygen). They will reach Jiri around 8pm tonight, and the gear is scheduled to fly in the morning to Syangboche. Everything is rolling along on schedule! Ang Jangbu Sherpa reports from Base Camp that Greg, Austin, and the Classic climbers and trekkers rolled into Base Camp today and are doing well. 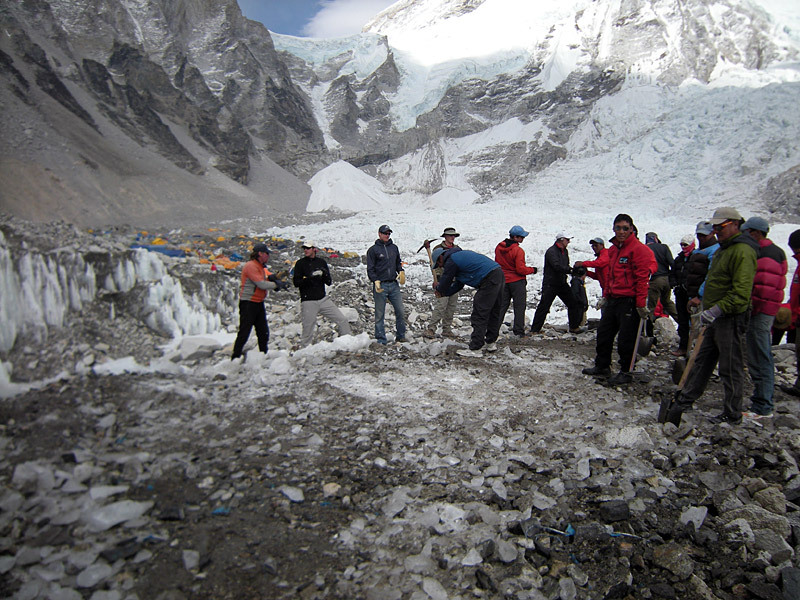 The IMG sherpa team have been working hard to put the finishing touches on the Base Camp construction. This morning we had Phunuru, Dawa and Mingma Tshering leading a safety refresher for the sherpa team and then after lunch most of our sherpas joined with some of the sherpas from other teams to build a better helipad. 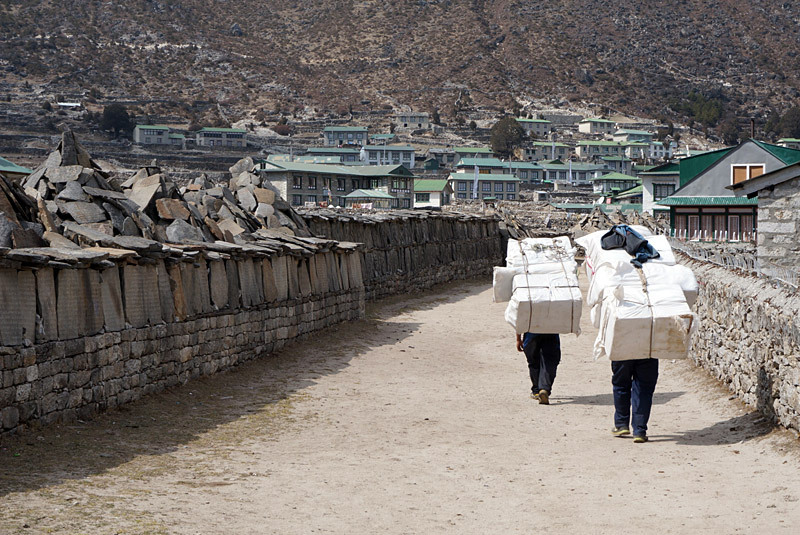 Tomorrow will be the big sherpa puja, and then they will start making carries up the hill the following day. Down at Lobuche Peak, Justin Merle and the first hybrid team climbed up to high camp for the night and are ready to go to the summit tomorrow morning. Meanwhile today, guides Hamill, Mainer, Polloczek, Phinjo and the second hybrid climbers descended down to Lobuche Base Camp. 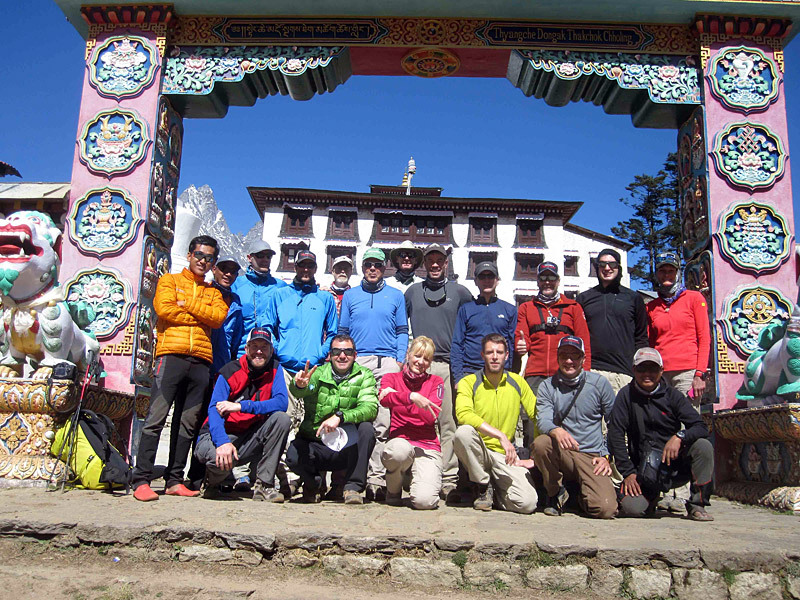 Also at Lobuche BC are Jenni and Luke with their classic, Lhotse, and Lobuche climbers and trekkers. Everyone is doing well! 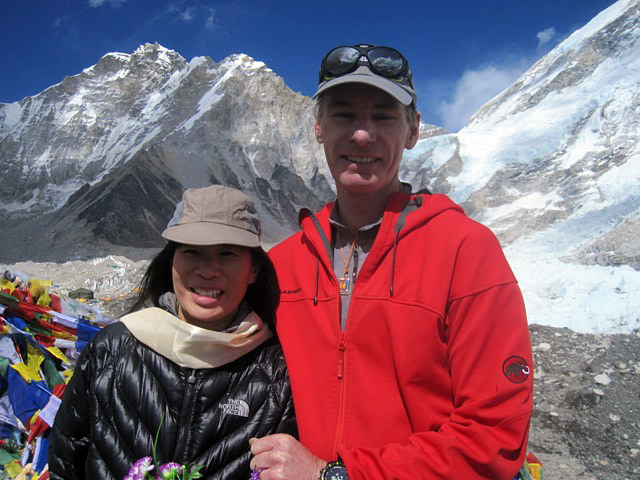 IMG guide Mike Hamill reports that team members Loretta and Jim were married at Everest base camp today. They have been together for 10 years, and today was the perfect occasion to tie the knot. Jim is staying to climb Mt. Everest with the team, and Loretta leaves tomorrow to start the trek back to Kathmandu. A huge congratulations to the happy couple on their special day. Down at Lobuche Peak, the Classic team had a good acclimatization hike today up to Lobuche High Camp, and will be coming up to Everest BC tomorrow. Meanwhile, Justin and Kami and the first Hybrid team left Everest BC and descended back down to Lobuche BC today to prepare for their ascent. Their plan is to move to Lobuche High Camp tomorrow. Also, during the day today, Tashi and Pasang Nuru fixed rope on Lobuche to get the route prepared for climbing. 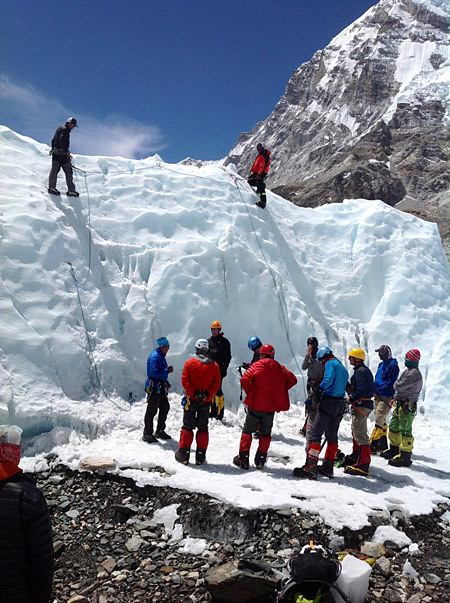 The second Hybrid team with Andy and Phinjo, along with guides Mainer and Hamill and their climbers, spent the day today training adjacent to Everest BC on the ice of the Khumbu Glacier. Their plan is to descend to Lobuche Peak BC tomorrow where they will meet Luke and Jenni's team. 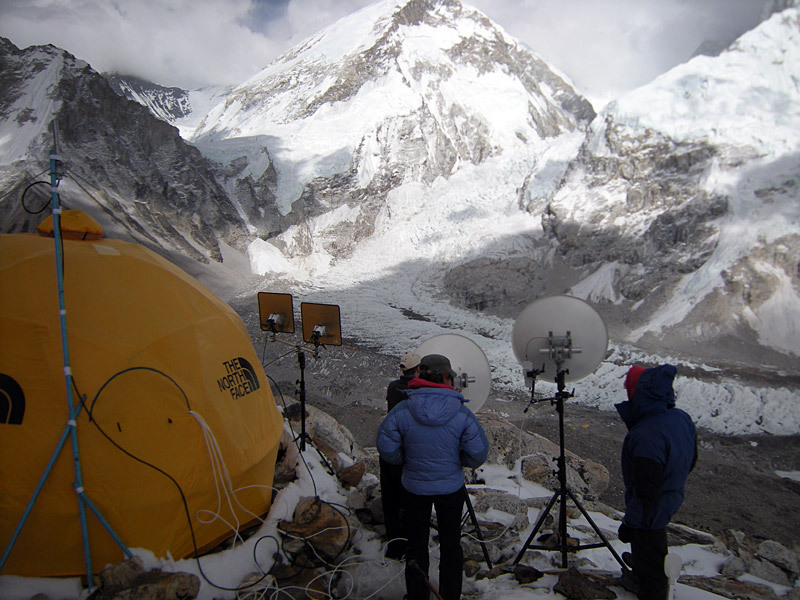 Our IMG Lobuche Base Camp gets used twice by our IMG climbers. 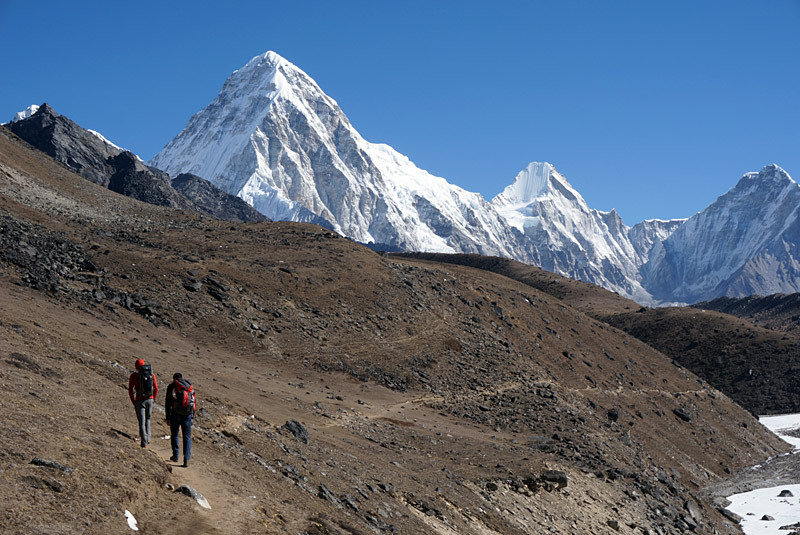 With comfortable accommodations and great day hiking in the area, it's an excellent place to spend several nights for acclimatization on the first trip up the Khumbu Valley, before making the jump up to Everest BC. 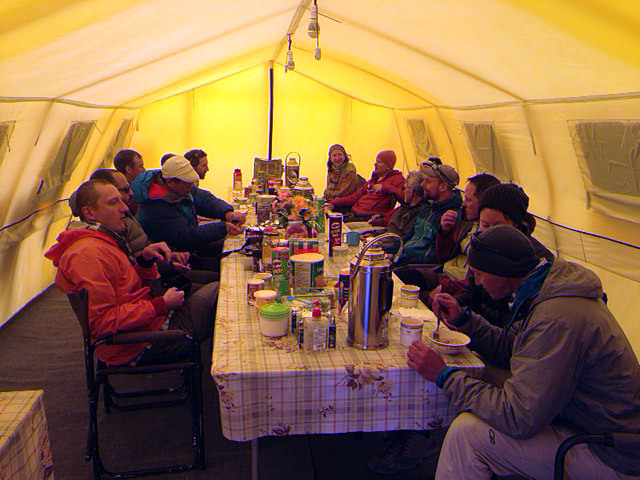 The first team of Classic climbers are there now and will spend one more night at Lobuche BC. Tomorrow they will move up to Everest BC, and at the same time, our third team with Jenni and Luke will be moving up from Pheriche to Lobuche BC for their acclimatization session. After spending three or four nights up at Everest BC and taking several days to practice ice climbing and ropework out on the Khumbu Glacier, our climbers will then go back down to Lobuche BC for their climb of Lobuche Peak. The Hybrid climbers will be doing this in the next couple days. All the training and acclimatization at EBC, along with the acclimatization at LBC, and the ascent of 20,000 foot Lobuche will give everyone the very best chance to get 100% ready. The first time people go up the Khumbu Icefall to Everest Camps 1 and 2 is a very hard climb, so it is super important to be as prepared as possible for the challenges to come. IMG leader Ang Jangbu reports that guides Andy, Phinjo, and the second Hybrid team moved up to Everest BC today from Lobuche BC, and that everyone is doing well. Congrats to all the hybrid climbers for making it up to BC strong and healthy. That is the way to start a trip! Meanwhile, down valley, the Classic team with Greg and Austin are acclimatizing well and today moved up to Lobuche BC from Pheriche. Down in Deboche, Jenni and Luke report that their team of climbers and trekkers are also doing well. 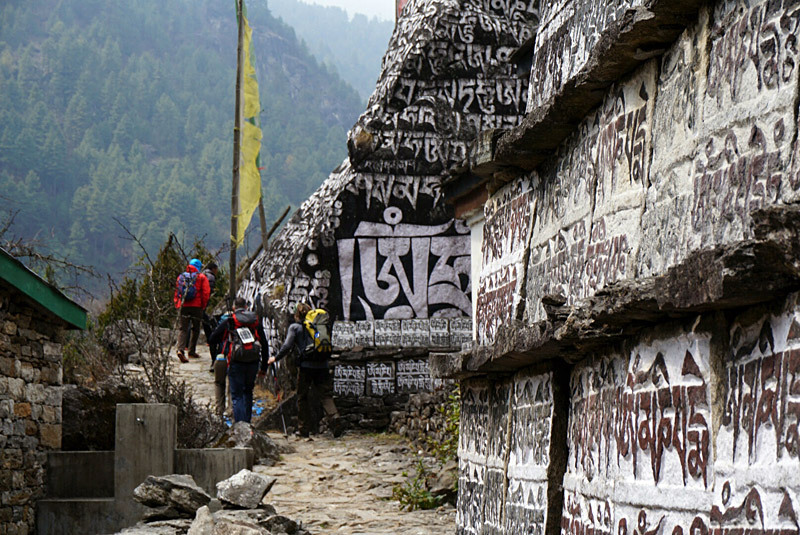 They took an acclimatization day today with a hike up to the Tengboche monastery. 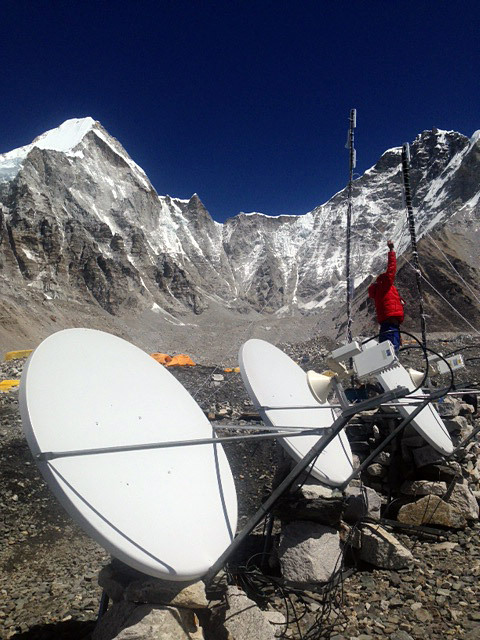 At Everest BC, the sherpas now have our VHF base station and antennas set up, so Base Camp can now communicate by radio to our teams both up the mountain and down the valley. For internet, we have our Bgan internet terminal ready to go if necessary but are hoping that the new wireless data system at EBC works well. New this year, this is operated by Mercantile, a Nepal telecom, and IMG has subscribed to this service. If this works consistently, it will be less expensive than the Bgan, and easier than trying to use the limited bandwidth of the mobile network at Gorak Shep. The big constraints for comms at BC are the perennial issues of electricity (these systems are all power hogs), atmospherics (if it is snowing, the signals are often attenuated), and bandwidth (what happens when everyone tries to log on at the same time). Only time will tell! 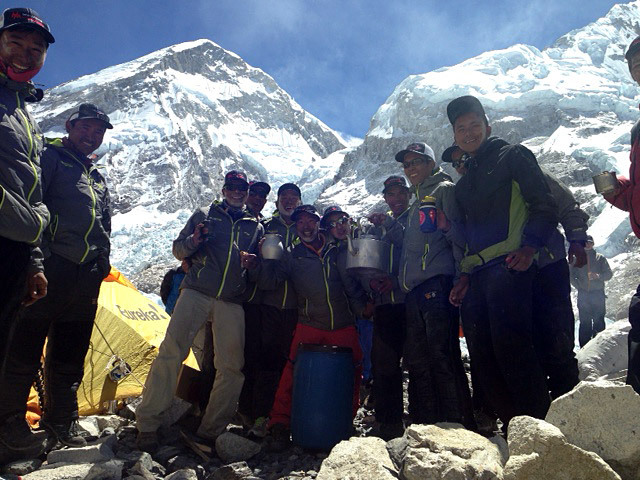 IMG leader Ang Jangbu reports from Everest BC that five IMG sherpas made it to Camps 1 and 2 today and managed to claim the campsites that we wanted. 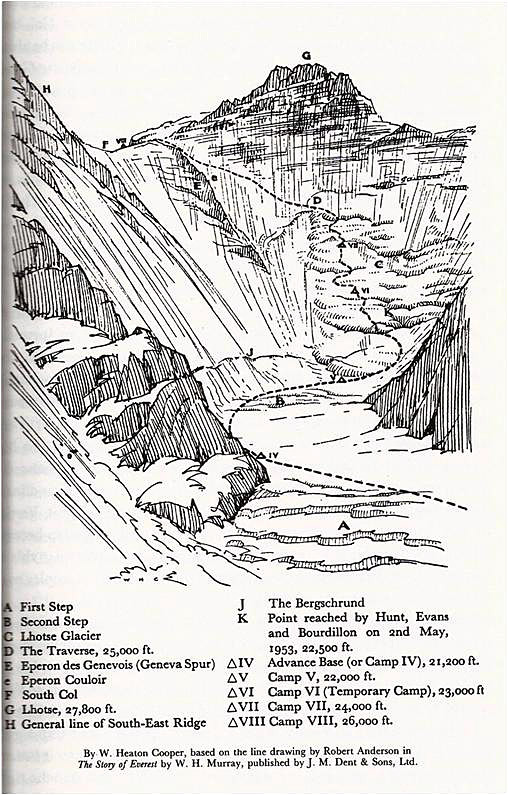 Sounds like the Icefall route is looking reasonable. 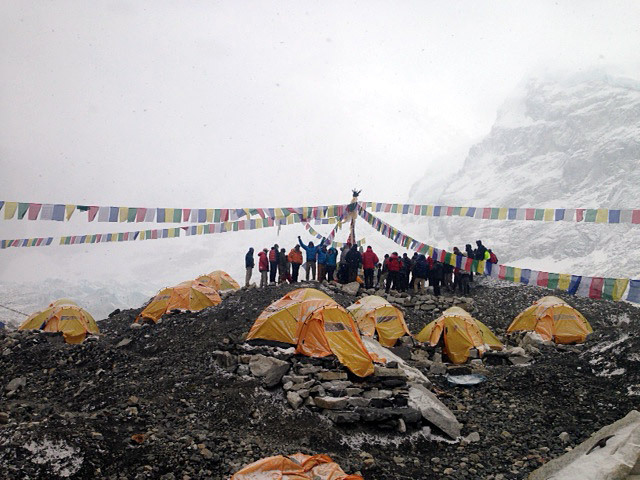 The rest of the IMG sherpas have all reported to BC now, and the sherpa team will be doing their Base Camp puja soon. IMG guides Merle and Bunce pulled in to EBC today with their first hybrid team and everyone is doing well. The second hybrid team are scheduled to arrive to EBC tomorrow. Today our cooks Kaji and Passang (Camp 2 cook) sorted and packed 75 food loads to go to Camp 2 over the next few days. 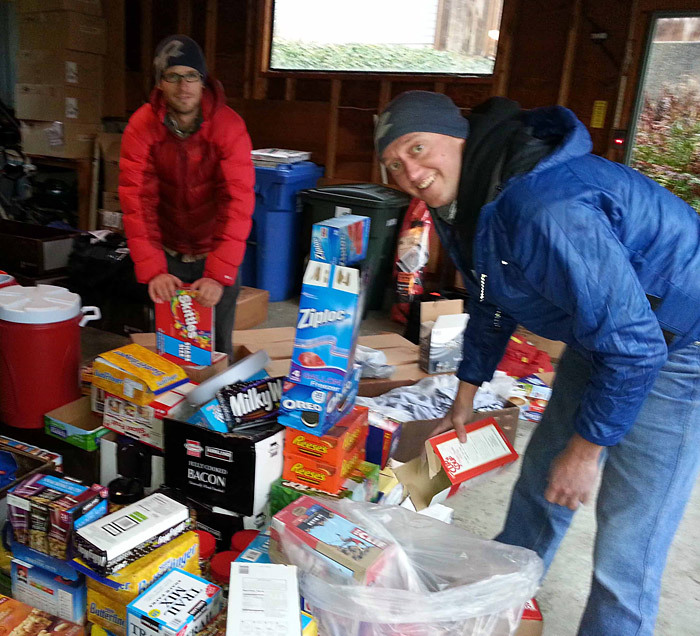 Building and stocking Camp 2 will be an ongoing process... this camp is the key to the upper mountain logistics. So far, so good! 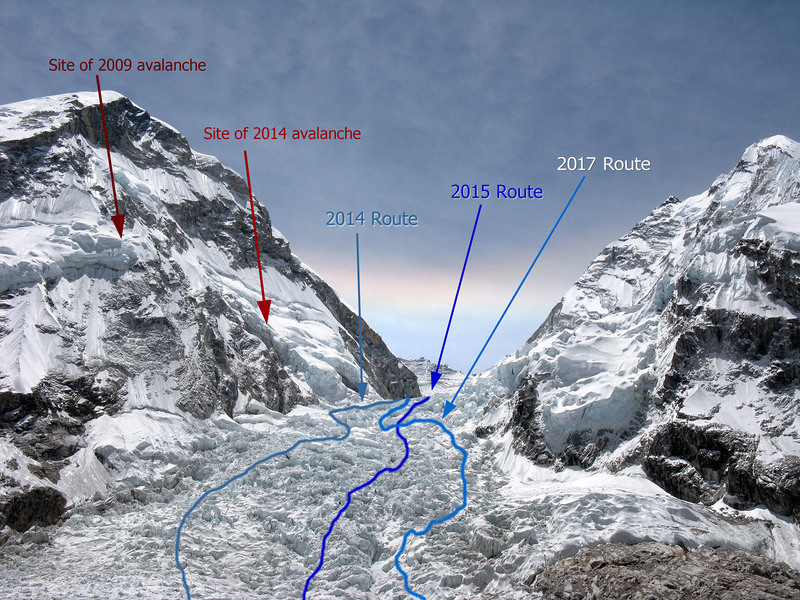 Khumbu Icefall Route is Open! 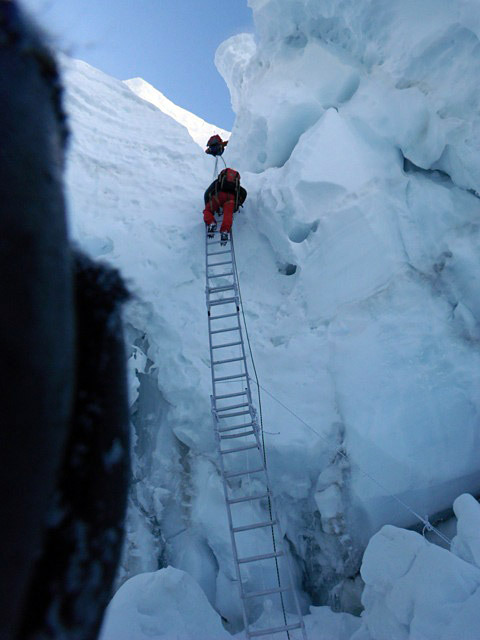 IMG leader Ang Jangbu Sherpa reports that the icefall doctors finished building the icefall route. We have five IMG sherpas heading for Camp 1 and Camp 2 early tomorrow morning to claim our campsites. So... this is the beginning of the real climbing. Down the valley, the Hybrid climbers are at Lobuche Base Camp, and the first group will be heading to Everest BC tomorrow. Greg and the Classic team visited Lama Geishe in Pangboche today for their puja, and they are now ensconced in Pheriche and doing well. 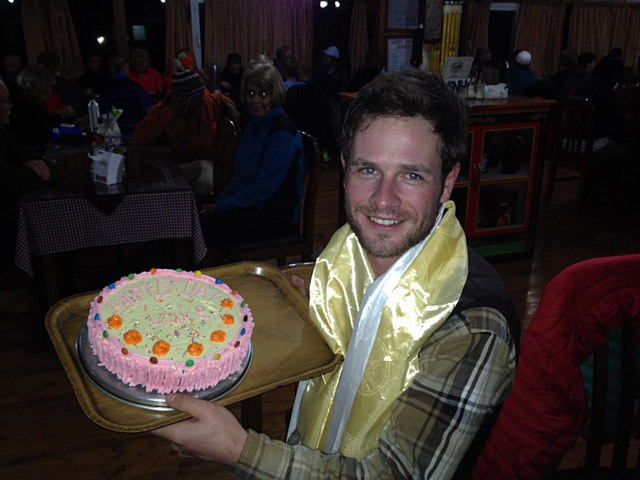 Jenni and her team of Classic, Lhotse, and Lobuche climbers and trekkers enjoyed guide Luke Reilly's birthday celebration tonight, and they are ready to head for Deboche in the morning. We are rolling! IMG leader Greg Vernovage reports that everything is going well with the IMG teams. There was some snowfall today in the Khumbu. 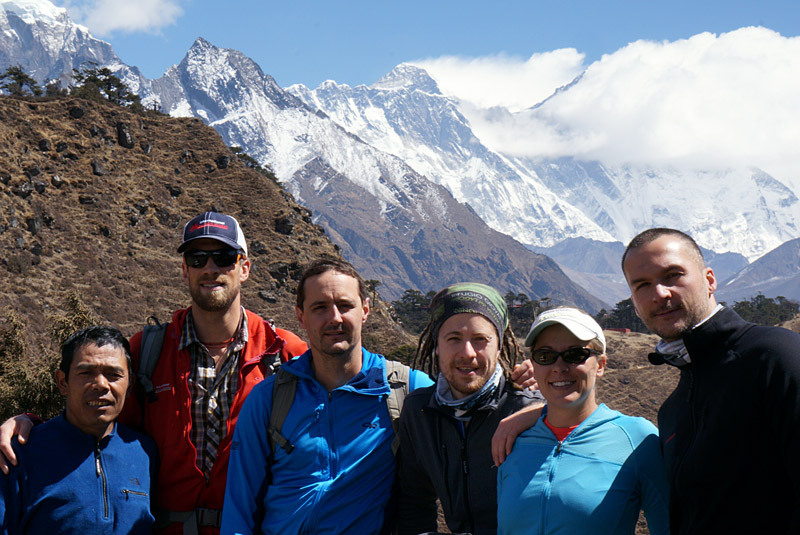 Jenni, Luke, and their crew are in Namche and have enjoyed some nice acclimatization hiking. They will be heading to Deboche tomorrow. Up in Deboche, Greg, Austin, and the Classic team have visited Tengboche monastary and also enjoyed some good acclimatization. They will be heading to Pheriche tomorrow. Up in Pheriche, we have some of the Hybrid climbers staying a couple extra nights there with Phinjo, while others made the move up to Lobuche Base Camp. 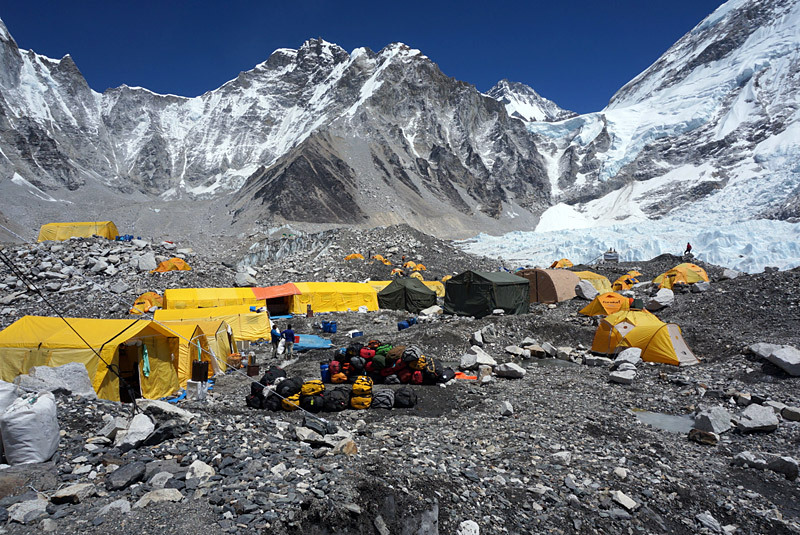 IMG's Lobuche Base Camp is now established at about 16,000 feet on the south side of the mountain (there are other camps on the east side). The camp is super comfortable with kitchen and dining tents, toilets, and comfy sleeping tents with nice thick foam mattresses! 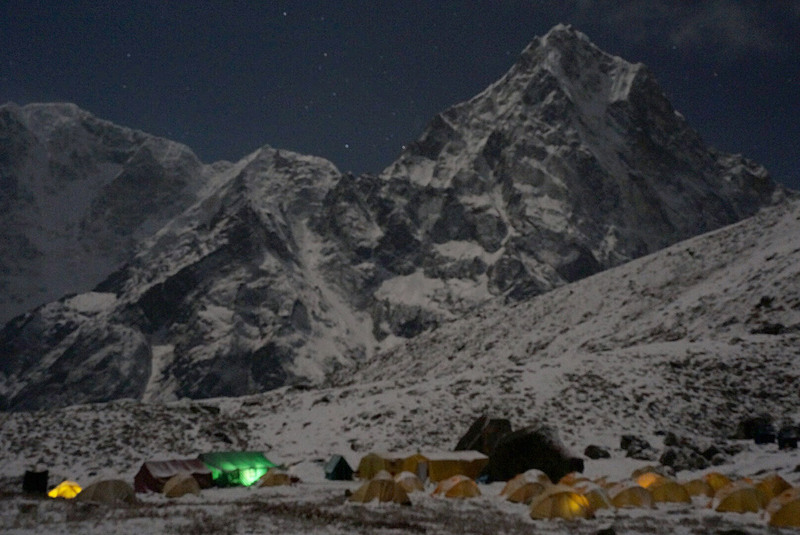 All IMG climbers and trekkers will be spending several nights there before moving to Everest Base Camp. Once the team hits Lobuche BC, they are finished staying in the lodges until it is time to hike back to Lukla! From here on up, with our own cook staff preparing food, we are now 100% in control of our environment. It is super important that everyone be healthy and acclimatized when they make the move up to Everest BC, and Lobuche BC is a perfect place to get prepared. It seems we often only hear the bad news when it comes to flying in Nepal, with stories of crashes, cancelled flights, and lost luggage. However, the introduction of civil aviation has literally been a game changer for this mountainous and inaccessible country. Prior to 1992 there were only a few international and domestic flights a day. Then, in 1992 everything changed with the adoption of a much more liberal aviation policy by the government. 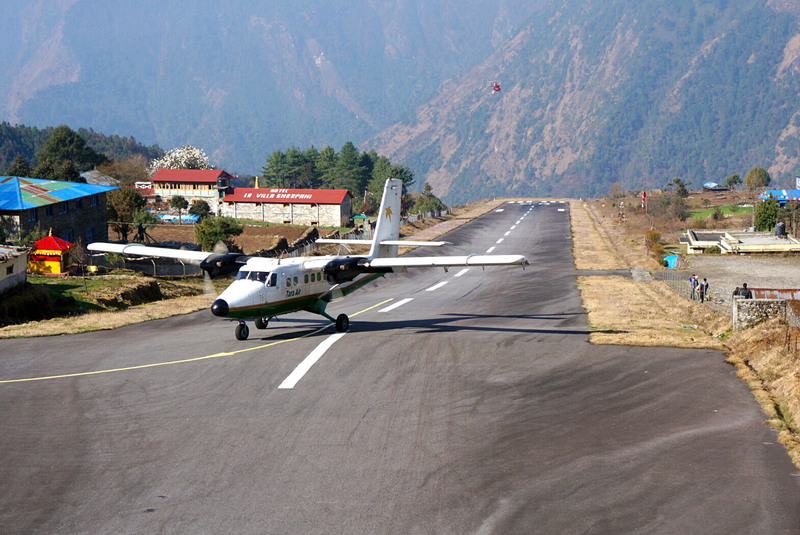 Subsequently many more airlines/planes/helicopters have come to Nepal, new landing strips have been built all over the country, and flying has become a very dynamic part of the transportation picture. Today was a good day for flying. 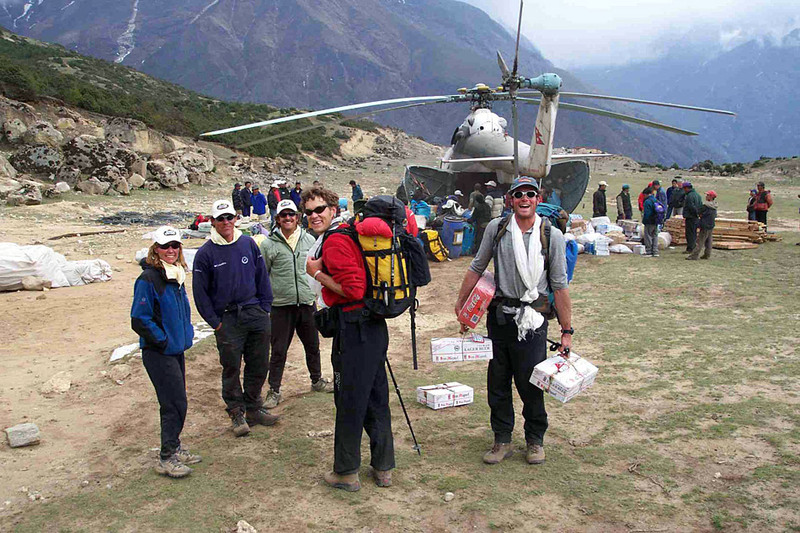 Our final IMG team, with Jenni, Luke, and Jangbu boarded on schedule and were in Lukla in time for a late morning snack. 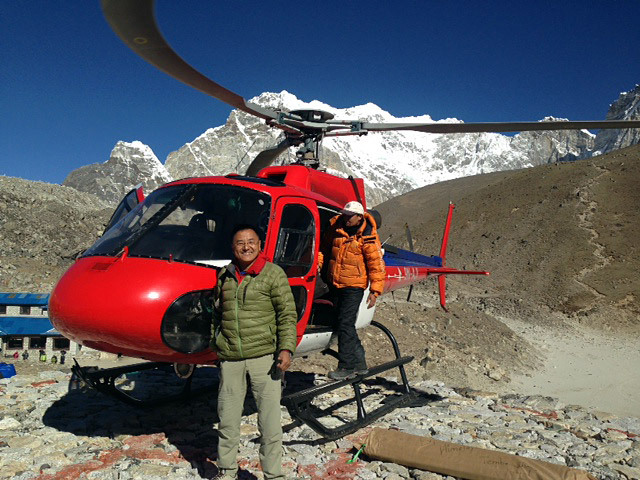 Then Jangbu (being the wily sherpa that he is) hitchhiked a heli ride up to Gorak Shep! 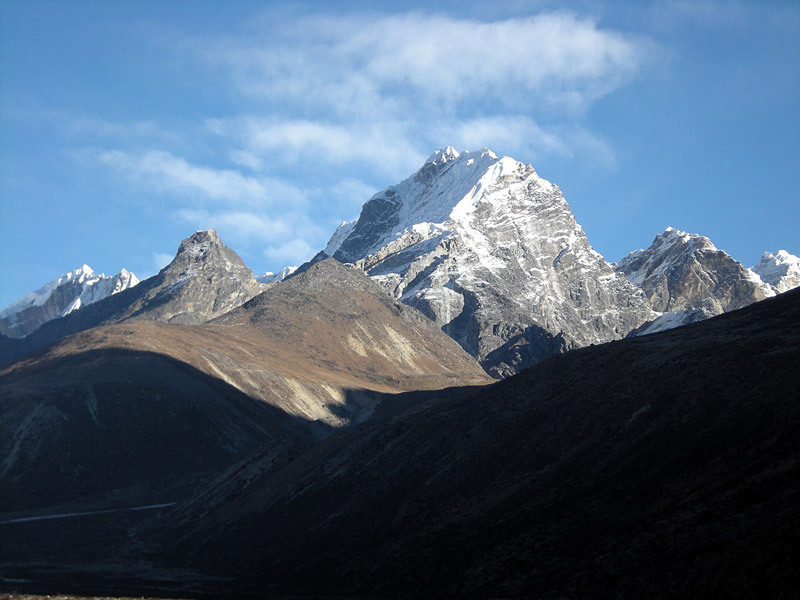 Jangbu will be going down to Lobuche Base Camp to meet up with our IMG Lobuche sherpa. 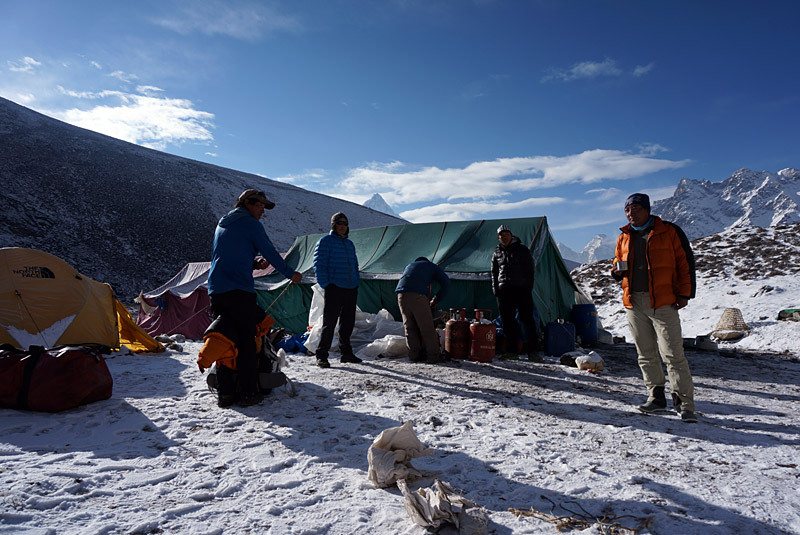 These guys, led by 11x Everest summiter Tashi Tseri from Pangboche, have been working on getting that camp set up for our climbers and trekkers. 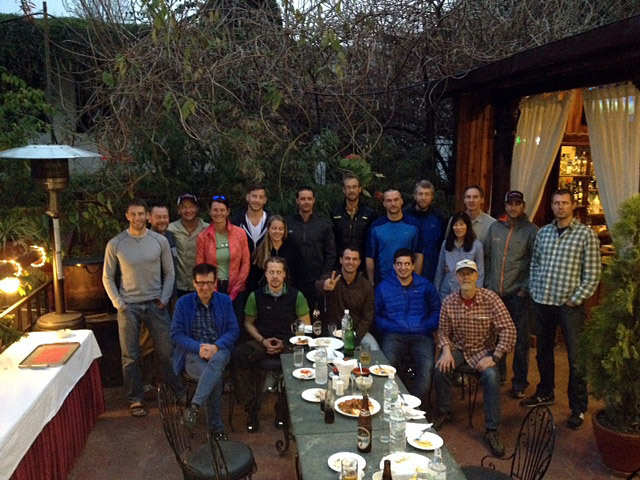 IMG guides Jenni Fogle Pfafman and Luke Reilly have met the last team of Classic, Lhotse, and Lobuche climbers and trekkers as they arrived to Kathmandu. Today the climbers made their obligatory visit to the Ministry and had their equipment checks. Everyone is set and tonight they enjoyed a team welcome dinner, with an early wake up call planned for the morning to go to the airport for the Lukla flight and the start of their trek. 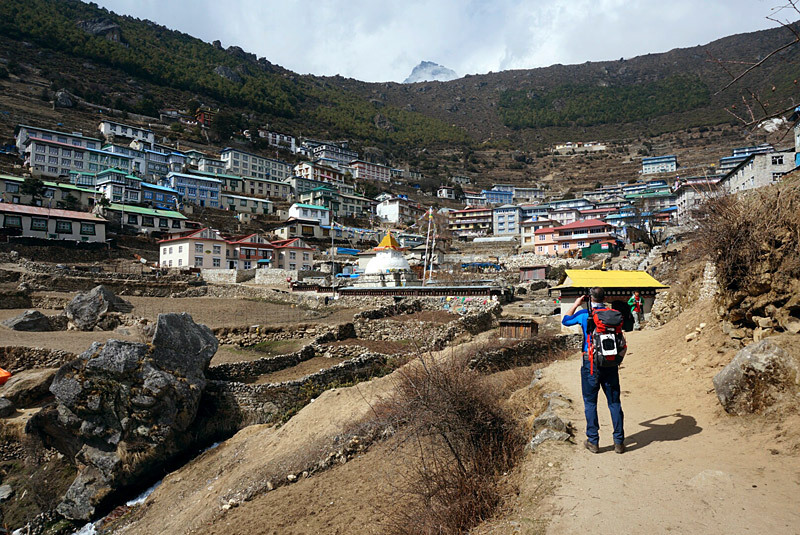 Up in Khumbu the first Hybrid team, with Justin and Max, trekked up to Pheriche today with a stop en route at Lama Geishe's to do a puja ceremony with the team. Now that they have reached 14,000 feet, these climbers are starting to feel the bite of the cold mountain wind. Justin says everyone is doing well and that despite some wind and cloud, there was no snowfall today and that the views have been impressive. The second Hybrid team with Andy, Phinjo, Mike, and Aaron are in Deboche tonight. Today they visited the Tengboche Monastery today and plan to head to Pheriche tomorrow via a stop by Lama Geshe's. Mike reports that "our team is all healthy so far, acclimatizing well, and they all seem to be fit and strong." He sent this photo of the members in front of Tengboche. In Namche Greg, Austin, and the Classic team are doing well and had a nice acclimatization hike to day to the Everest View Hotel. 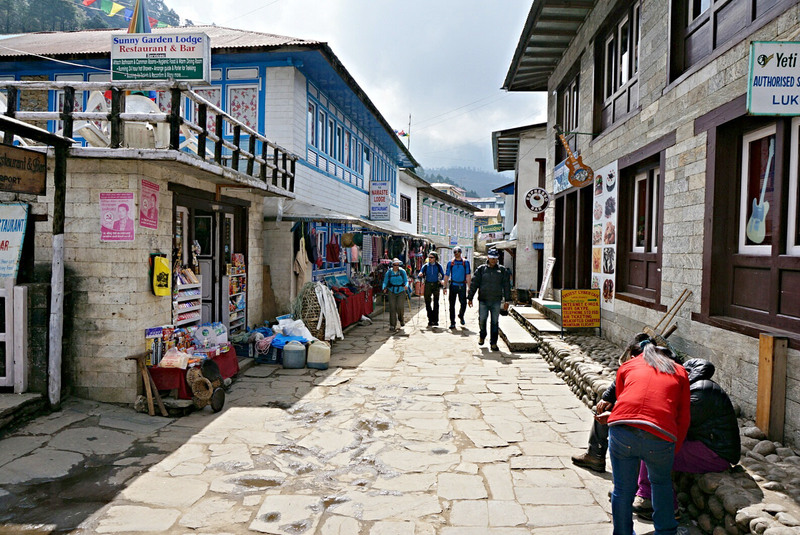 The Classic climbers rolled into Namche, and everyone is doing well. 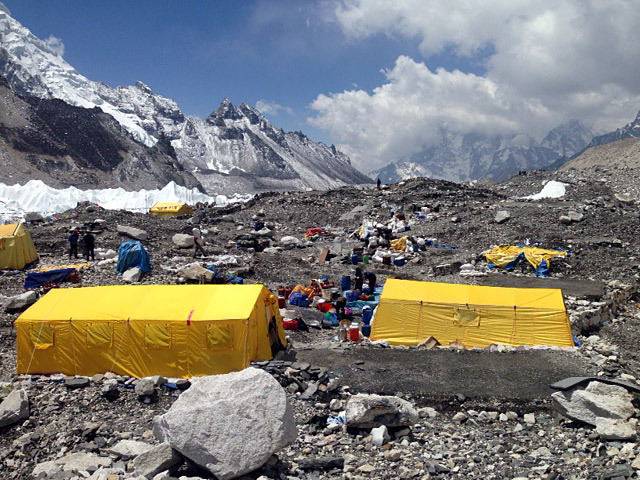 Up at Everest Base Camp Phunuru says the lead sherpas wrapped up the major BC construction, and now have been dismissed to run home (literally) for a few days of rest. Since most are from Pangboche/Phortse area, they can cover that mileage in a few hours! They will report back to Base Camp on April 3. 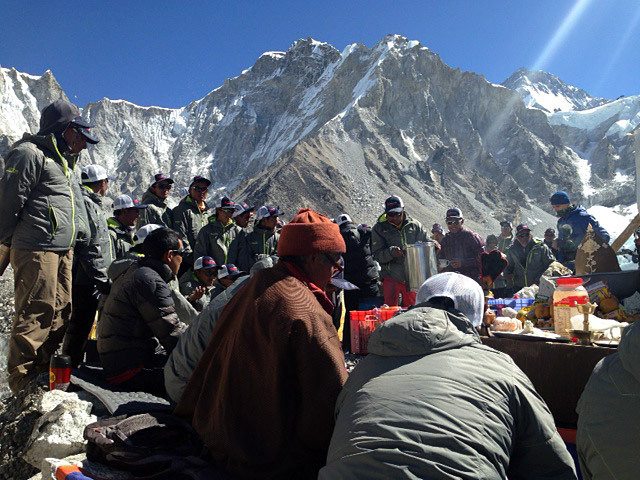 Staying up there at EBC are Phunuru, three climbing Sherpas and some of the cook staff. 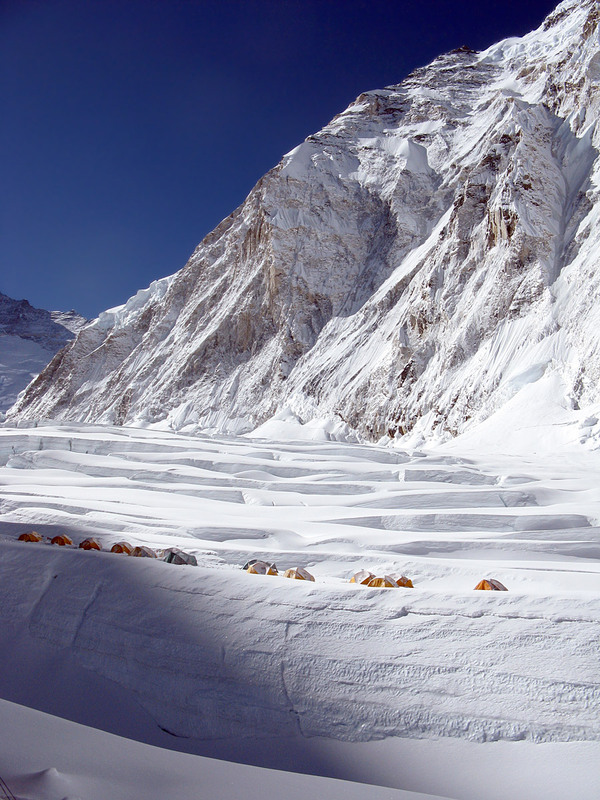 All the rest of the climbing sherpas (except for those who are on trek with members) will also report to base camp on April 3rd, and they will finish setting up the remaining sleeping tents on the 4th. Then, on the 5th, our first Hybrid team with Justin and Max arrives! Phunuru says that the Icefall Doctors are making good progress. They are now working on the route above the football field, and if the conditions and weather remain good it sounds like the Camp 1 route will be finished in few days time! 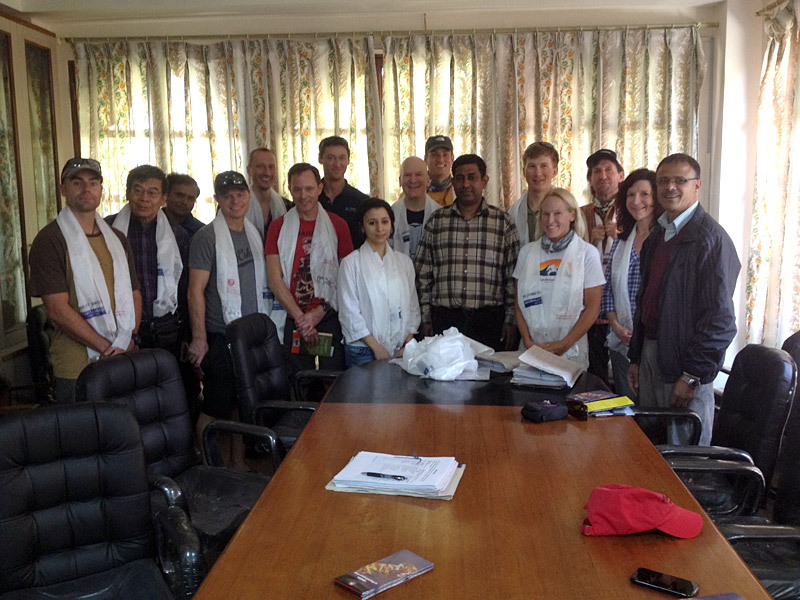 The HRA doctors are planning to arrive on April 5th to start running the EBC clinic. The Classic climbers and trekkers arrived on schedule this morning. I spoke to Greg in Lukla, and he said they were hitting the trail at 8am and were heading for Phakding. Weather was good and everyone was doing well, with all luggage in tow. That is the way to start!! IMG Classic Climbers and Trekkers Ready to Go! IMG leaders Greg and Jangbu report that the team had another busy day equipment checks, Ministry visits, and duffel shuffle action. IMG guides Luke Reilly and Austin Shannon rolled into town and have been helping get everyone set to go. Jangbu and Pasang were able to get the team's duffel bags sent to Lukla this afternoon, so now we are ahead of the curve on the luggage for tomorrow. 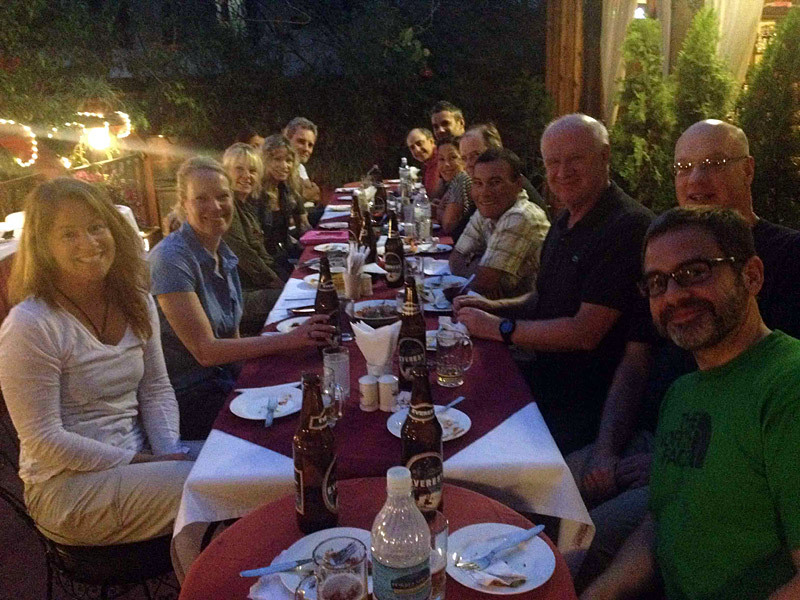 Tonight the team is having their welcome dinner and preparing for an early departure for Lukla flights tomorrow morning. Luke will stay back in Kathmandu to meet IMG guide Jenni Fogle Pfafman, who is now on her way to Nepal. They will come in to BC with our final group of Classic, Lhotse, and Lobuche climbers... in a few days. IMG leaders Greg and Jangbu report that the first group of Classic climbers and trekkers have now arrived to Kathmandu with all their duffel bags. Tomorrow they will have their team meeting, visits to the Ministry, and welcome dinner. After some long plane flights, everyone is excited to hit Kathmandu! The duffels that we sent to Manthali yesterday arrived today into Lukla via Cessna 208 cargo flight and now have been sent on up the hill. 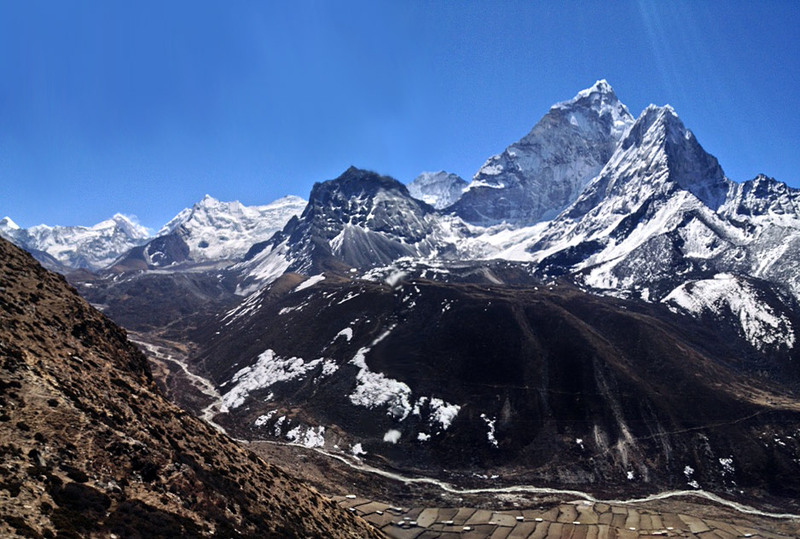 Up in the Khumbu, everything is proceeding on schedule for our Hybrid teams. They are all in Namche Baazar tonight and doing well. Justin Merle reports that his crew had a nice hike up to Khumjung today, and they were able to send some nice photos from their hike. Highlights of the day included getting to watch the MI 17 heli arrive in Syangboche from Jiri and having some great views from up by the Everest View Hotel. Looks like the weather is cooperating! Today was complicated by the Kathmandu airport shutting down for part of the day due to visibility issues, causing both domestic and international flights to be delayed. IMG guides Polloczek, Hamill, and Mainer waited for hours at the airport with their teams before finally flying to Lukla later in the afternoon. They will stay there tonight and trek all the way up to Namche tomorrow. For the second day in a row we sent extra duffel bags to Manthali, to be flown in to Lukla from there instead of from Kathmandu (where a mega backlog continues). 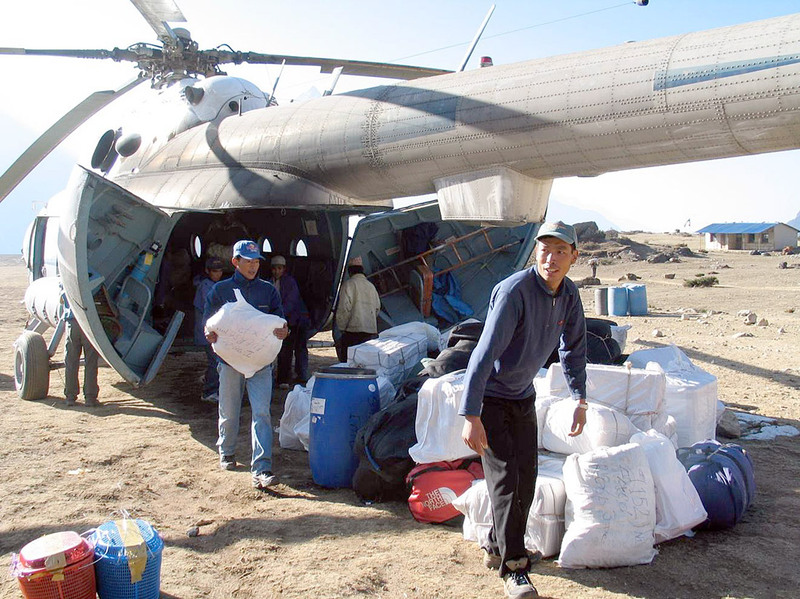 We also had more gear go to Syangboche today from Jiri on the big MI 17 cargo helicopter. Up in the Khumbu, IMG guides Merle and Bunce and their team made it up the big hill today, and are doing well in Namche (about 11,000 feet). Internet is good in Namche, and they sent some photos. Ang Pasang met them on arrival, and they have checked with the Liaison Officers and the SPCC and National Park offices to validate their permits. 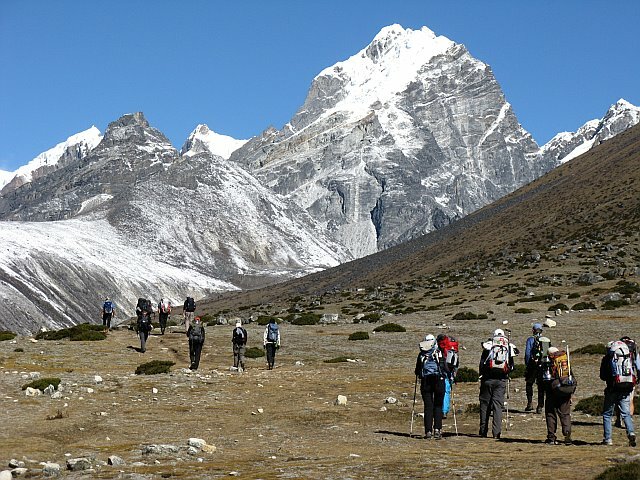 Tomorrow they are planning to do an acclimatization hike to Everest View Hotel and Khumjung. 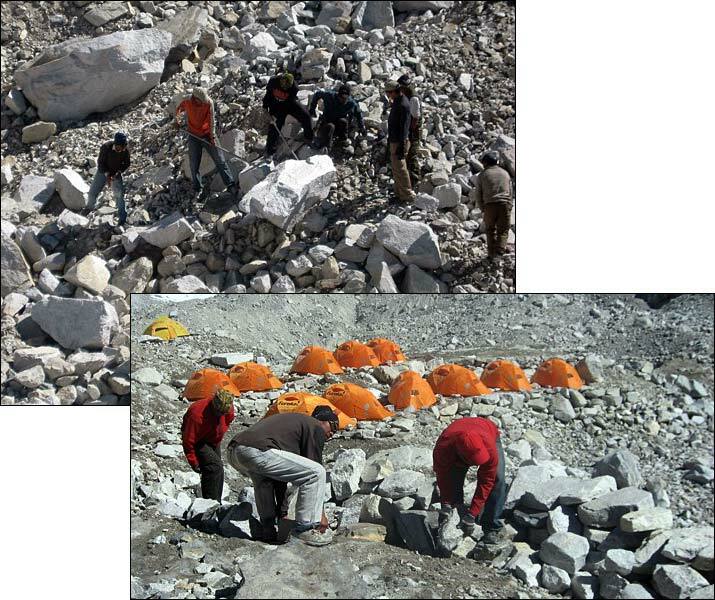 At Everest Base Camp, Kami Sherpa reports that their construction project is going well. He said they are almost finished setting up all the big dining and kitchen tents. Next on the schedule will be building the toilets and the platforms for the sleeping tents. IMG leaders Greg and Jangbu report from Kathmandu that the first wave of IMG climbers flew in to Lukla today, on schedule. 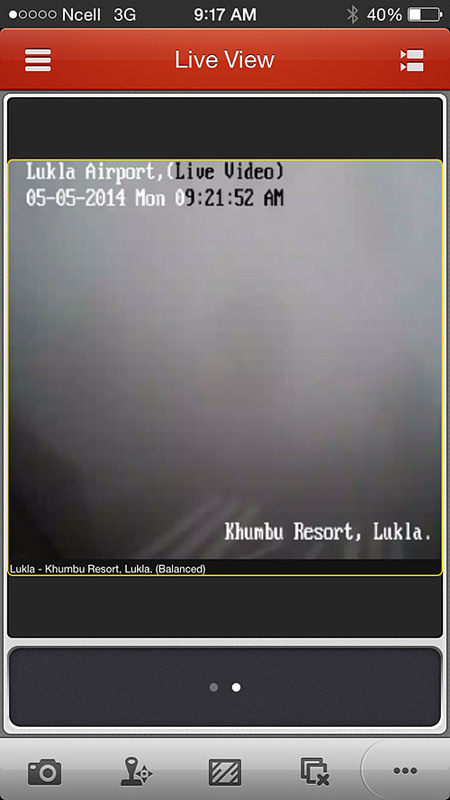 However, the weather has been marginal the last four days, so a lot of the Lukla flights have been cancelled. The result is a massive backlog of cargo in Kathmandu waiting to fly to Lukla (this is why we started flying team supplies in to Khumbu many weeks ago). To mitigate the current situation, Jangbu reports that today they sent Kaji Sherpa with a smaller truck filled with base camp duffels to Manthali (a small airstrip south of Jiri). 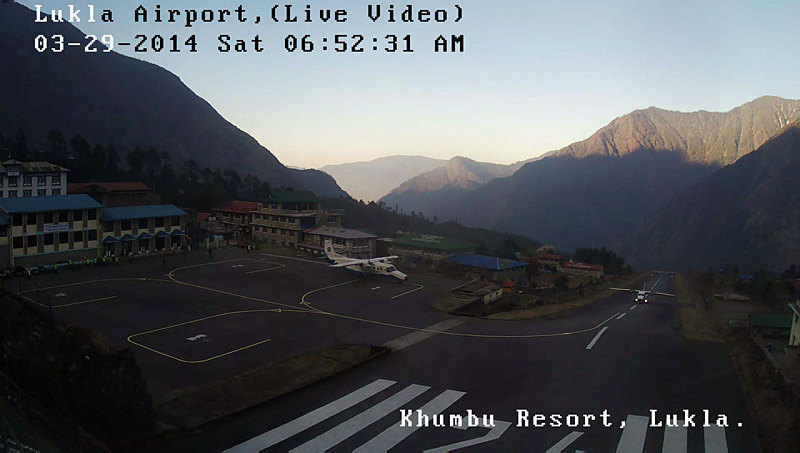 There is a better chance to get cargo flights tomorrow into Lukla from Manthali than from Kathmandu. The second wave of IMG climbers have arrived to Kathmandu, and they have now had their team meetings, followed by the mandatory visit to the Ministry. 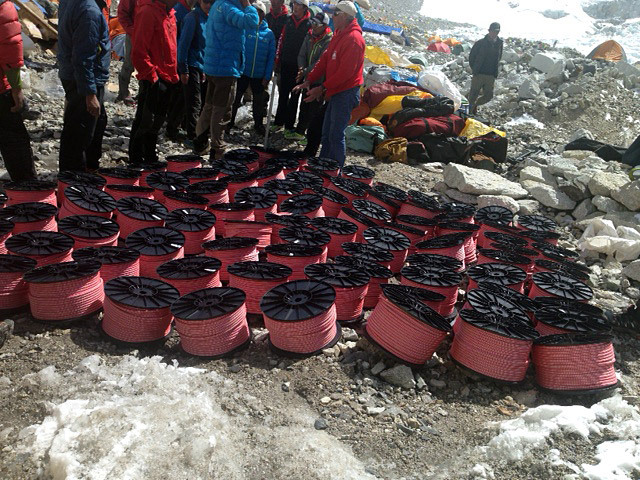 They are now all packed up and ready to go for their Lukla flights tomorrow morning. 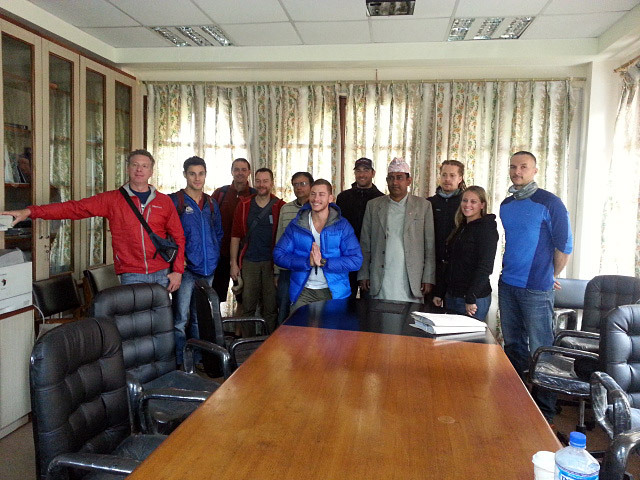 Our IMG guides arrived Kathmandu and have now completed the permit briefings at the Ministry for our Everest and Lhotse teams. We are now Official! 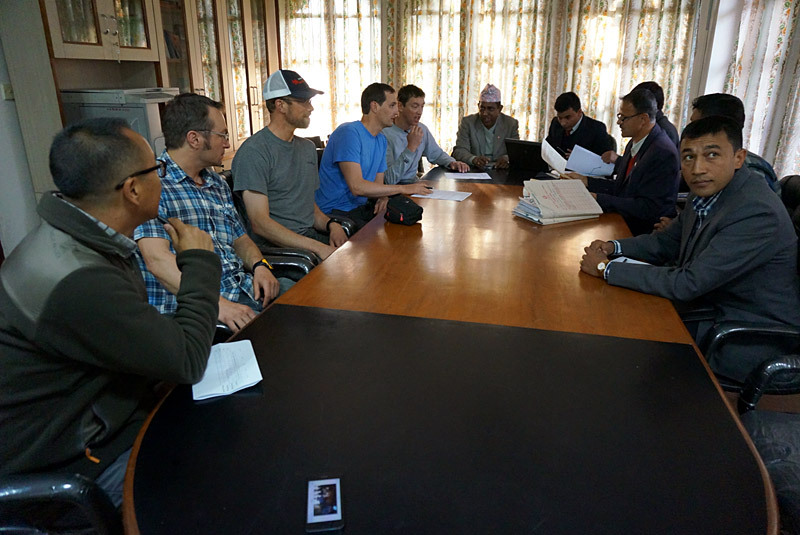 The climbers are also arriving Kathmandu now, and the first team did their mandatory member meeting at the Ministry (this is a new regulation for 2014). 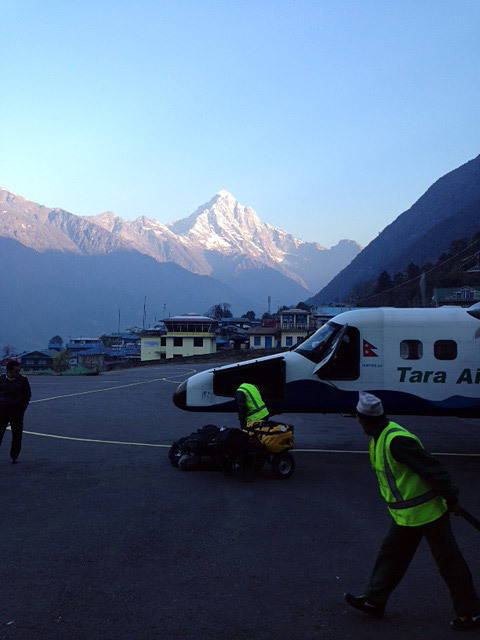 First Lukla flights are early tomorrow morning. We'll be keeping our fingers crossed that the weather is good. IMG Guides on Their Way to Everest! Sometimes the hardest part of these big trips is just getting out the front door. 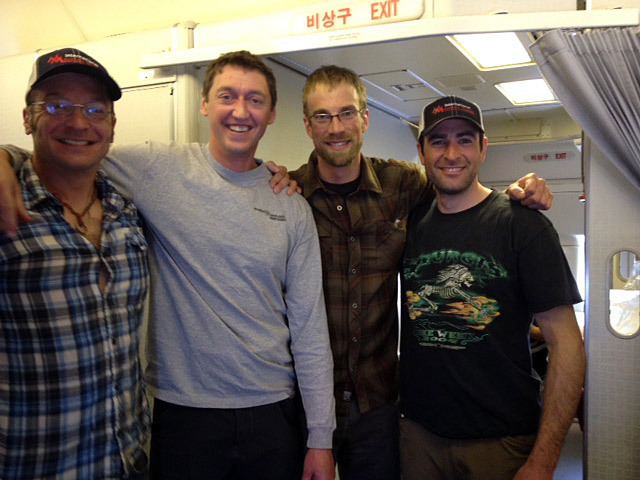 I am happy to report that our IMG Everest guides are now on their way to Nepal. Mike Hamill left on Tuesday, and Greg, Aaron, Justin, and Andy left today. The rest of the team go in a few days. Next stop for today's crew is Seoul, then on to Bangkok, and then to Kathmandu the following day. 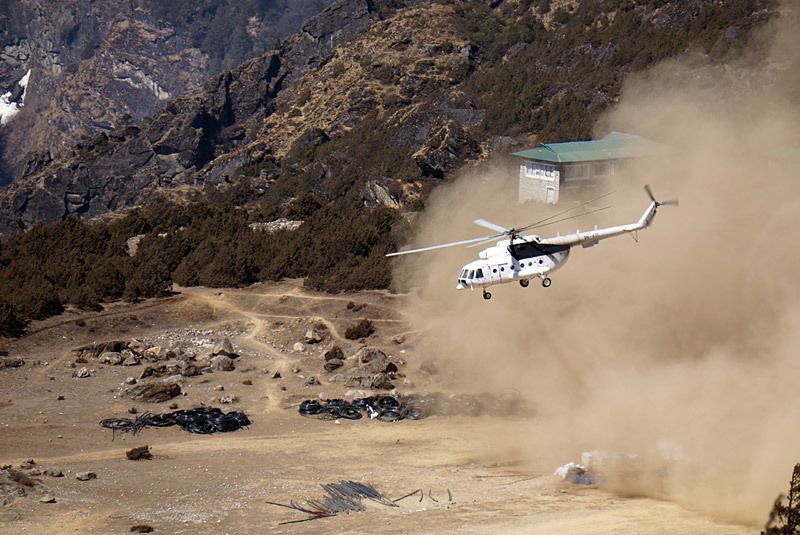 Up in the Khumbu, Jangbu reports that we had 143 loads flown by helicopter to Syangboche yesterday, with more cargo still in Jiri waiting to fly. 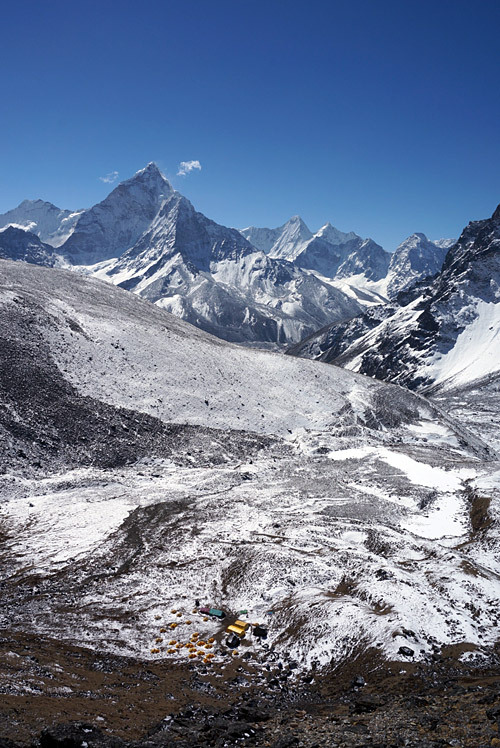 The sherpas at Everest Base Camp have been making good progress on building the camp, despite fresh snowfall earlier this week (3 inches in Phortse and 6 inches at Base Camp). 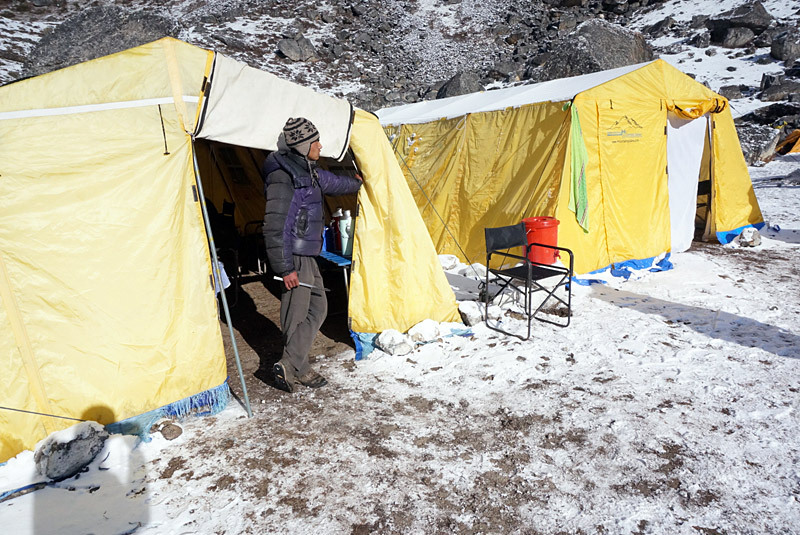 Ang Jangbu reports from Nepal that the Icefall Sherpas (the "doctors") have now reached Base Camp and are starting to work on the route. Today the first wave of sixteen IMG sherpas are on their way to Base Camp, under the leadership of veteran guide Ang Chhiring (Kami) from Pangboche. These guys will be working hard the next two weeks getting our Classic and Hybrid camps put together. Also, today our Kathmandu team sent another large container truck of food and gear to Jiri for transport by helicopter to Syangboche. 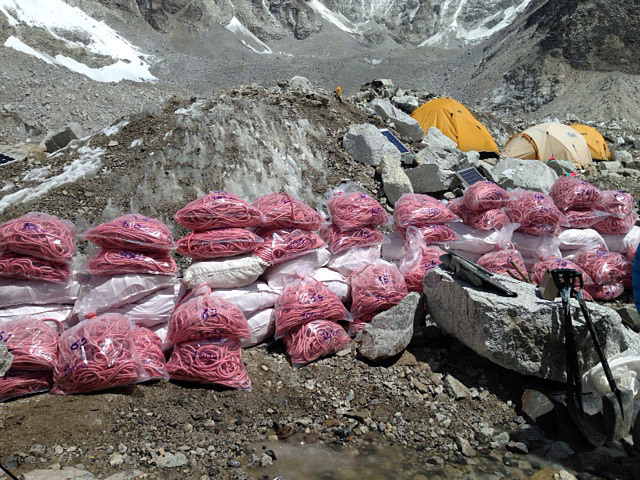 These supplies will be received by Phunuru and Ang Pasang for transport to Base Camp by yaks and porters. 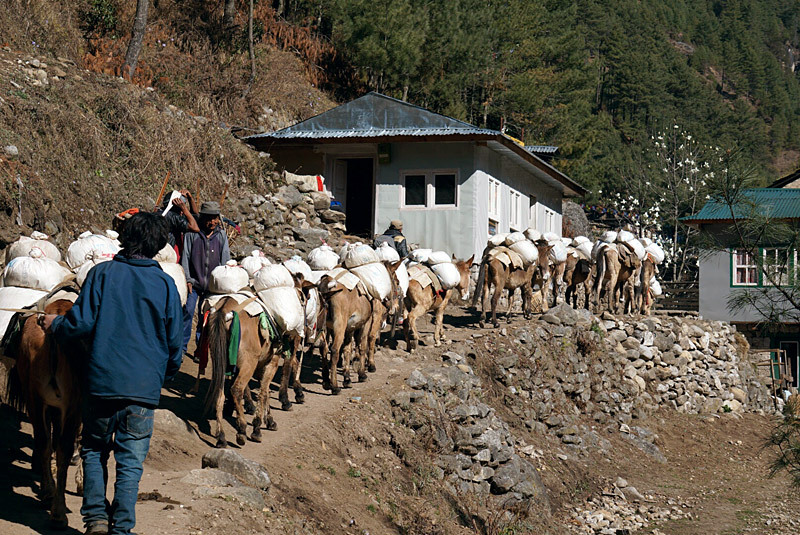 It is a busy time of the year in Nepal, so we are continuing to move supplies uphill to stay ahead of the wave! 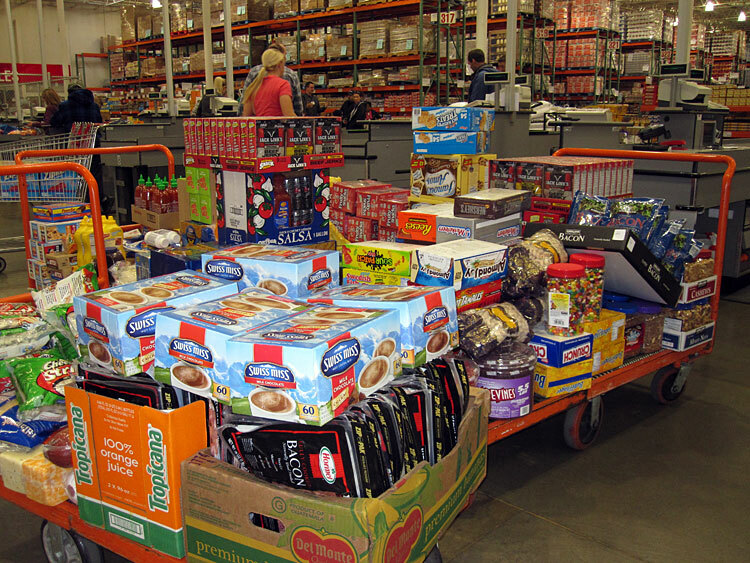 Everest guides Greg Vernovage, Luke Reilly, and Austin Shannon did a big food shopping spree this week to Costco, for all the staples like coffee, sriracha, oreos, bacon, and ranch dressing. Yum! 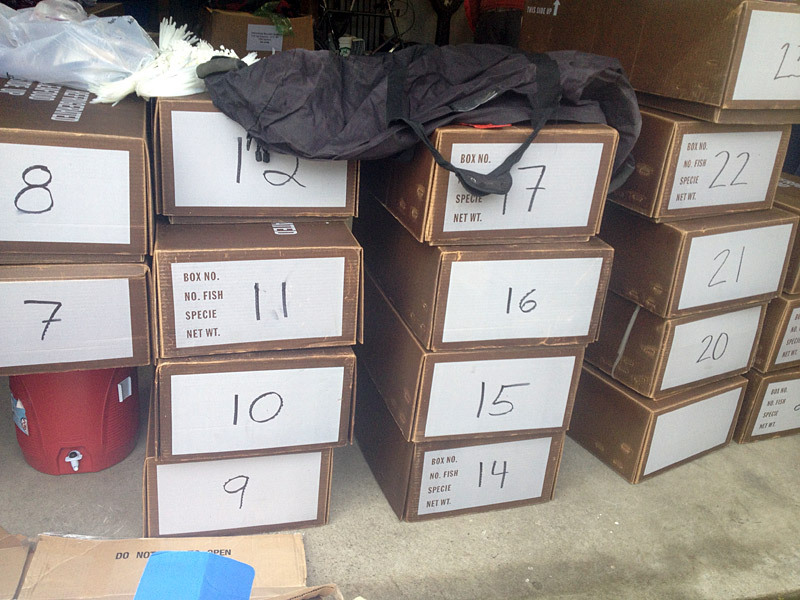 Everything is now packed, shipped, and on the way across the Pacific to Nepal. 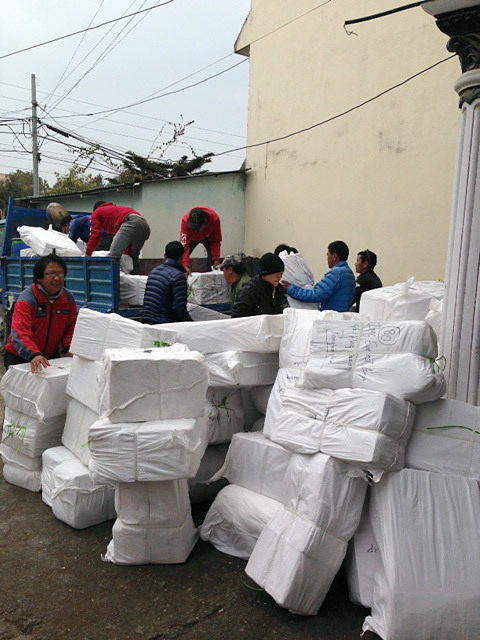 Ang Jangbu reports that our big shipment of oxygen cylinders has arrived in Nepal, cleared customs, and has now been re-packed for the journey to base camp. 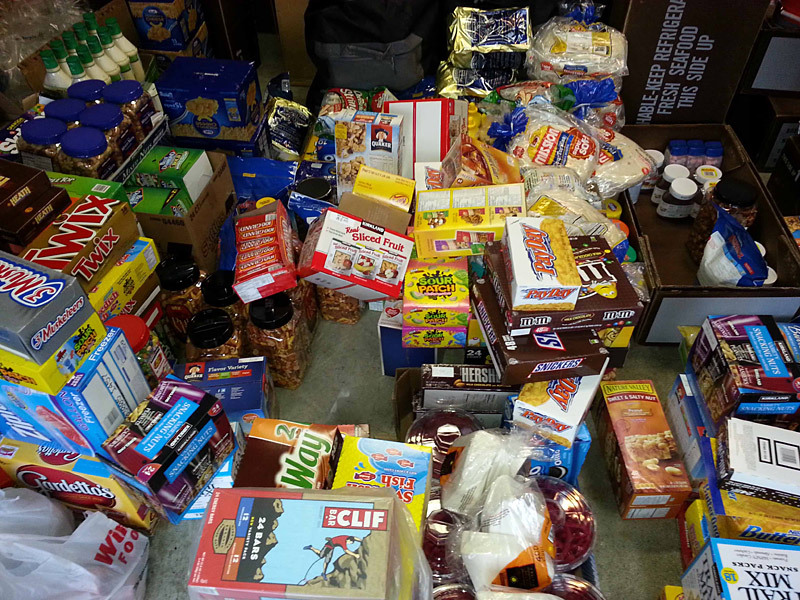 Next up is our big food shipment, heading out the door later this week. 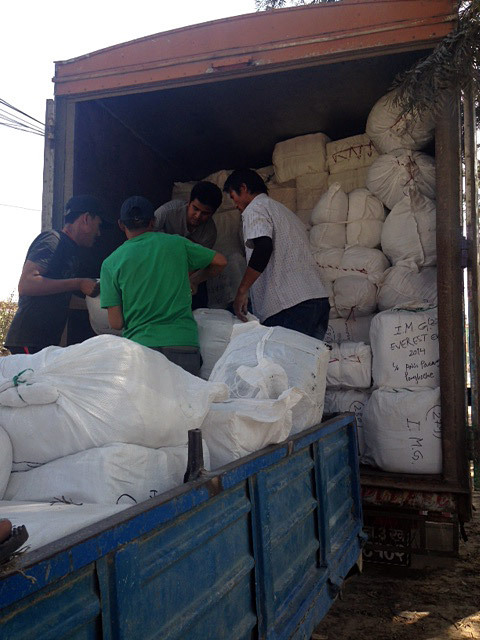 The Sherpas finished packing up another batch of supplies, and today they loaded up the truck to drive it all to Jiri. All total we have 143 porter/yak loads (3,626kg) of food and gear all packed and ready. The plan is that it will get flown by helicopter from Jiri to Syangboche in the next few days. 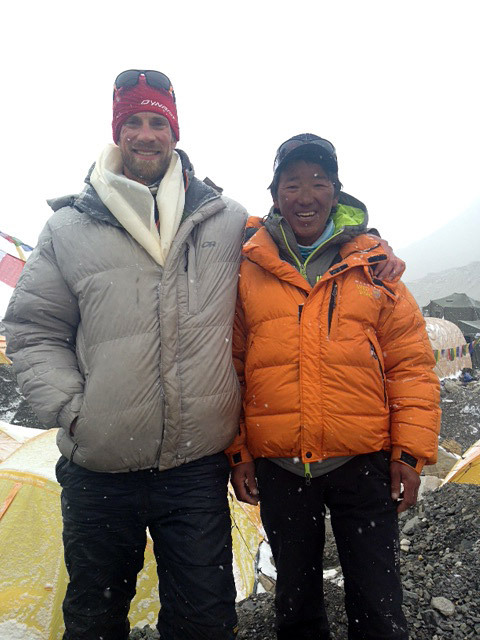 Ang Jangbu reports that he sent Kami and Mingma Tshering to base camp this past week to claim our IMG campsite. 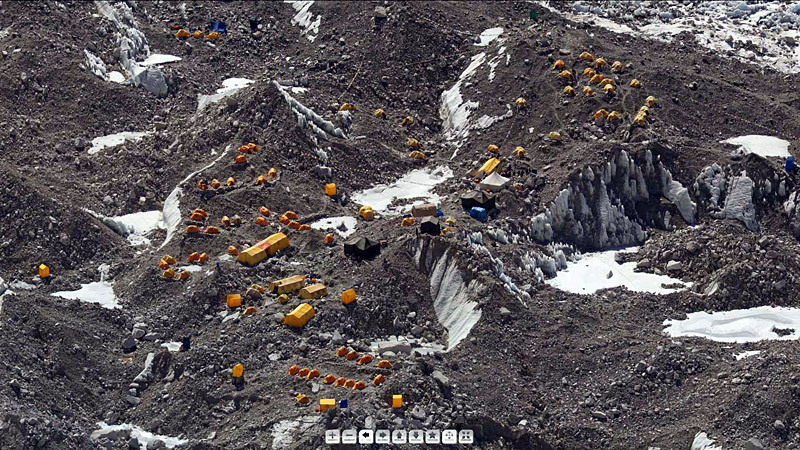 Since Everest Base Camp (EBC) is situated on rocky material underlain by active glacier, the site changes every year. They report that the base camp looks better than last year, with more flat space for tents and good water nearby. 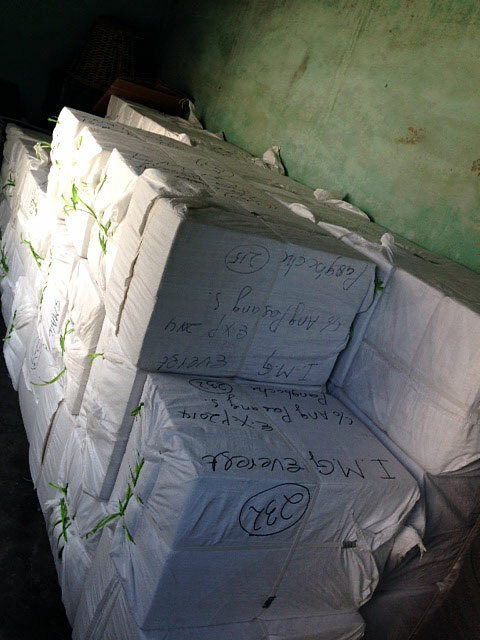 Back in Kathmandu our sherpas have now taken delivery of another large load of food and are busy packing this up into yak/porter loads which will be trucked to Jiri (a one-day drive by truck east from Kathmandu which shortens the heli flight time for the cargo loads). 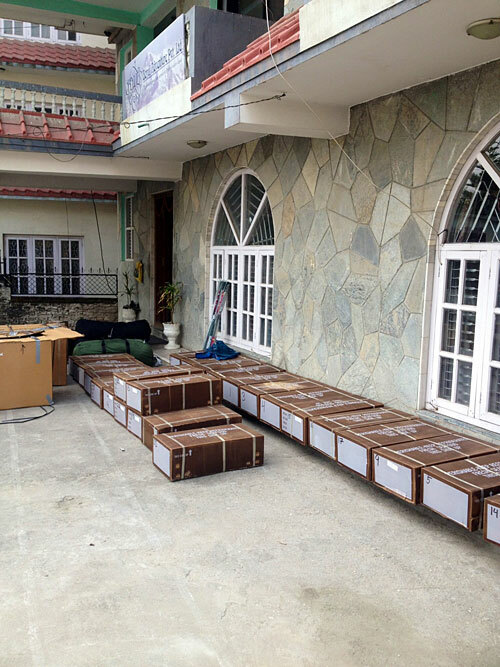 Ang Jangbu reports from Kathmandu that they have now sent the first 46 loads of expedition gear (1124 kg) by helicopter to Syangboche, where it was received by Ang Tshering and Purna and stored. This included a lot of tents, generators, and camp gear. We have another load of cargo (mainly food) heading up next week with Ang Pasang and Phunuru, and they will then start moving the gear further up the valley. We are looking to another great year on Everest. 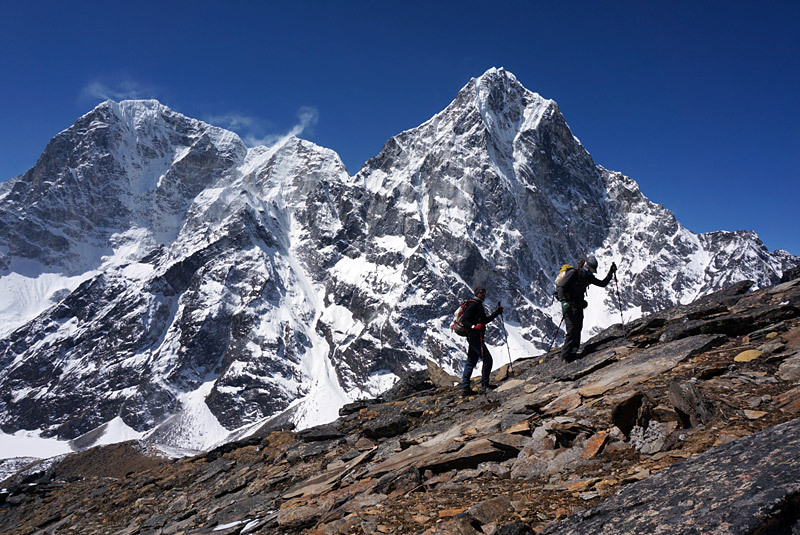 This upcoming 2014 expedition will be our 22nd one that we have conducted to the world's highest peak. So far we have led 381 people from 22 countries and 21 expeditions to the summit. We have a good looking team shaping up for spring 2014, representing 8 different countries. We are looking forward to sharing expedition news with you. 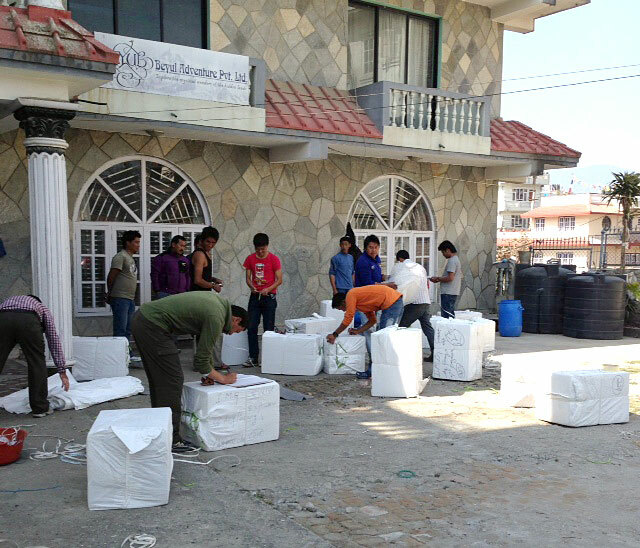 Currently we are assembling food and equipment in the US for shipment to Nepal. 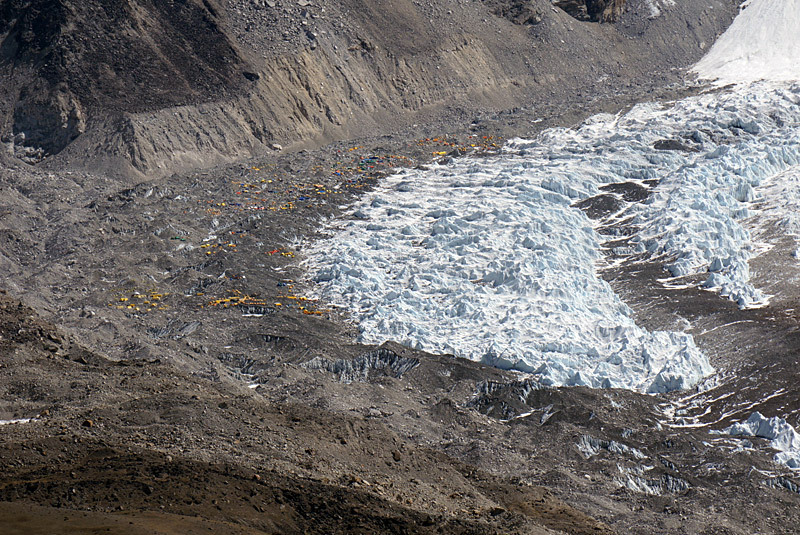 The first loads of gear and fuel will be sent into the Khumbu starting in January.